This article is about the public debate over scientific conclusions on climate change. For denial, dismissal or unwarranted doubt of the scientific consensus, see climate change denial. Global mean surface temperature change from 1880 to 2017, relative to the 1951–1980 mean. The black line is the global annual mean and the red line is the five-year lowess smooth. The blue uncertainty bars show a 95% confidence limit. Source: NASA GISS. 2 emissions compared to five of the IPCC's "SRES" emissions scenarios. The dips are related to global recessions. Image source: Skeptical Science. The global warming controversy concerns the public debate over whether global warming is occurring, how much has occurred in modern times, what has caused it, what its effects will be, whether any action should be taken to curb it, and if so what that action should be. In the scientific literature, there is a strong consensus that global surface temperatures have increased in recent decades and that the trend is caused by human-induced emissions of greenhouse gases. No scientific body of national or international standing disagrees with this view, though a few organizations with members in extractive industries hold non-committal positions. The controversy is, by now, political rather than scientific: there is a scientific consensus that climate change is happening and is caused by human activity. Disputes over the key scientific facts of global warming are more prevalent in the media than in the scientific literature, where such issues are treated as resolved, and such disputes are more prevalent in the United States than globally. Political and popular debate concerning the existence and cause of climate change includes the reasons for the increase seen in the instrumental temperature record, whether the warming trend exceeds normal climatic variations, and whether human activities have contributed significantly to it. Scientists have resolved these questions decisively in favour of the view that the current warming trend exists and is ongoing, that human activity is the cause, and that it is without precedent in at least 2000 years. Public disputes that also reflect scientific debate include estimates of how responsive the climate system might be to any given level of greenhouse gases (climate sensitivity), how global climate change will play out at local and regional scales, and what the consequences of global warming will be. Global warming remains an issue of widespread political debate, often split along party political lines, especially in the United States. Many of the issues that are settled within the scientific community, such as human responsibility for global warming, remain the subject of politically or economically motivated attempts to downplay, dismiss or deny them—an ideological phenomenon categorised by academics and scientists as climate change denial. The sources of funding for those involved with climate science—both supporting and opposing mainstream scientific positions—have been questioned by both sides. There are debates about the best policy responses to the science, their cost-effectiveness and their urgency. Climate scientists, especially in the United States, have reported official and oil-industry pressure to censor or suppress their work and hide scientific data, with directives not to discuss the subject in public communications. Legal cases regarding global warming, its effects, and measures to reduce it have reached American courts. The fossil fuels lobby has been identified as overtly or covertly supporting efforts to undermine or discredit the scientific consensus on global warming. In the United States, the mass media devoted little coverage to global warming until the drought of 1988, and James E. Hansen's testimony to the Senate, which explicitly attributed "the abnormally hot weather plaguing our nation" to global warming. The British press also changed its coverage at the end of 1988, following a speech by Margaret Thatcher to the Royal Society advocating action against human-induced climate change. According to Anabela Carvalho, an academic analyst, Thatcher's "appropriation" of the risks of climate change to promote nuclear power, in the context of the dismantling of the coal industry following the 1984–1985 miners' strike was one reason for the change in public discourse. At the same time environmental organizations and the political opposition were demanding "solutions that contrasted with the government's". In May 2013 Charles, Prince of Wales took a strong stance criticising both climate change deniers and corporate lobbyists by likening the Earth to a dying patient. "A scientific hypothesis is tested to absolute destruction, but medicine can't wait. If a doctor sees a child with a fever, he can't wait for [endless] tests. He has to act on what is there." Many European countries took action to reduce greenhouse gas emissions before 1990. West Germany started to take action after the Green Party took seats in Parliament in the 1980s. All countries of the European Union ratified the 1997 Kyoto Protocol. Substantial activity by NGOs took place as well. The United States Energy Information Administration reports that, in the United States, "The 2012 downturn means that emissions are at their lowest level since 1994 and over 12% below the recent 2007 peak." The theory that increases in greenhouse gases would lead to an increase in temperature was first proposed by the Swedish chemist Svante Arrhenius in 1896, but climate change did not arise as a political issue until the 1990s. It took many years for this particular issue to attract any type of attention. In Europe, the notion of human influence on climate gained wide acceptance more rapidly than in the United States and other countries. A 2009 survey found that Europeans rated climate change as the second most serious problem facing the world, between "poverty, the lack of food and drinking water" and "a major global economic downturn". 87% of Europeans considered climate change to be a very serious or serious problem, while ten per cent did not consider it a serious problem. In 2007, the BBC announced the cancellation of a planned television special Planet Relief, which would have highlighted the global warming issue and included a mass electrical switch-off. The editor of BBC's Newsnight current affairs show said: "It is absolutely not the BBC's job to save the planet. I think there are a lot of people who think that, but it must be stopped." Author Mark Lynas said "The only reason why this became an issue is that there is a small but vociferous group of extreme right-wing climate 'sceptics' lobbying against taking action, so the BBC is behaving like a coward and refusing to take a more consistent stance." The authors of the 2010 book Merchants of Doubt, provide documentation for the assertion that professional deniers have tried to sow seeds of doubt in public opinion in order to halt any meaningful social or political progress to reduce the impact of human carbon emissions. The fact that only half of the American population believe that global warming is caused by human activity could be seen as a victory for these deniers. One of the authors' main arguments is that most prominent scientists who have been voicing opposition to the near-universal consensus are being funded by industries, such as automotive and oil, that stand to lose money by government actions to regulate greenhouse gases. A compendium of poll results on public perceptions about global warming is below. There is widespread recognition that the climate, irrespective of the cause, is changing—88% believe this to be true. However, the public is out of step with the scientific community, with 41% believing that climate change is being caused by both human activity and natural processes. 46% believe human activity is the main cause. Only a small minority reject anthropogenic climate change, while almost half (44%) are very concerned. However, there remains a large proportion who are not fully persuaded and hold doubts about the extent of the threat. There is still a strong appetite among the public for more information, and 63% say they need this to come to a firm view on the issue and what it means for them. The public continue to externalize climate change to other people, places and times. It is increasingly perceived as a major global issue with far-reaching consequences for future generations—45% say it is the most serious threat facing the World today and 53% believe it will impact significantly on future generations. However, the issue features less prominently nationally and locally, indeed only 9% believe climate change will have a significant impact upon them personally. The Canadian science broadcaster and environmental activist David Suzuki reports that focus groups organized by the David Suzuki Foundation in 2006 showed that the public has a poor understanding of the science behind global warming. This is despite publicity through different means, including the films An Inconvenient Truth and The 11th Hour. An example of the poor understanding is public confusion between global warming and ozone depletion or other environmental problems. A 15-nation poll conducted in 2006, by Pew Global found that there "is a substantial gap in concern over global warming—roughly two-thirds of Japanese (66%) and Indians (65%) say they personally worry a great deal about global warming. Roughly half of the populations of Spain (51%) and France (46%) also express great concern over global warming, based on those who have heard about the issue. But there is no evidence of alarm over global warming in either the United States or China—the two largest producers of greenhouse gases. Just 19% of Americans and 20% of the Chinese who have heard of the issue say they worry a lot about global warming—the lowest percentages in the 15 countries surveyed. Moreover, nearly half of Americans (47%) and somewhat fewer Chinese (37%) express little or no concern about the problem." A 47-nation poll by Pew Global Attitudes conducted in 2007, found, "Substantial majorities 25 of 37 countries say global warming is a 'very serious' problem." There are differences between the opinion of scientists and that of the general public. A 2009 poll, in the US by Pew Research Center found "[w]hile 84% of scientists say the earth is getting warmer because of human activity such as burning fossil fuels, just 49% of the public agrees". A 2010 poll in the UK for the BBC showed "Climate scepticism on the rise". Robert Watson found this "very disappointing" and said "We need the public to understand that climate change is serious so they will change their habits and help us move towards a low carbon economy." A 2012 Canadian poll, found that 32% of Canadians said they believe climate change is happening because of human activity, while 54% said they believe it's because of human activity and partially due to natural climate variation. 9% believe climate change is occurring due to natural climate variation, and only 2% said they don't believe climate change is occurring at all. Many of the critics of the consensus view on global warming have disagreed, in whole or part, with the scientific consensus regarding other issues, particularly those relating to environmental risks, such as ozone depletion, DDT, and passive smoking. Chris Mooney, author of The Republican War on Science, has argued that the appearance of overlapping groups of skeptical scientists, commentators and think tanks in seemingly unrelated controversies results from an organized attempt to replace scientific analysis with political ideology. Mooney says that the promotion of doubt regarding issues that are politically, but not scientifically, controversial became increasingly prevalent under the George W. Bush administration, which, he says, regularly distorted and/or suppressed scientific research to further its own political aims. This is also the subject of a 2004 book by environmental lawyer Robert F. Kennedy, Jr. titled Crimes Against Nature: How George W. Bush and Corporate Pals are Plundering the Country and Hijacking Our Democracy (ISBN 978-0060746872). Another book on this topic is The Assault on Reason by former Vice President of the United States Al Gore. Earlier instances of this trend are also covered in the book The Heat Is On by Ross Gelbspan. Some critics of the scientific consensus on global warming have argued that these issues should not be linked and that reference to them constitutes an unjustified ad hominem attack. Political scientist Roger Pielke, Jr., responding to Mooney, has argued that science is inevitably intertwined with politics. In 2015, according to The New York Times and others, oil companies knew that burning oil and gas could cause global warming since the 1970s but, nonetheless, funded deniers for years. Summary of opinions from climate and earth scientists regarding climate change. Click to see a more detailed summary of the sources. Seven papers into man-made global warming consensus, from 2004–2015, by Naomi Oreskes, Peter Doran, William Anderegg, Bart Verheggen, Neil Stenhouse, J. Stuart Carlton, and John Cook. Peer-reviewed research rejecting man-made global warming is almost non-existent as of 2013–14. The finding that the climate has warmed in recent decades and that human activities are producing global climate change has been endorsed by every national science academy that has issued a statement on climate change, including the science academies of all of the major industrialized countries. Attribution of recent climate change discusses how global warming is attributed to anthropogenic greenhouse gases (GHGs). [T]here is a strong, credible body of evidence, based on multiple lines of research, documenting that climate is changing and that these changes are in large part caused by human activities. While much remains to be learned, the core phenomenon, scientific questions, and hypotheses have been examined thoroughly and have stood firm in the face of serious scientific debate and careful evaluation of alternative explanations. * * * Some scientific conclusions or theories have been so thoroughly examined and tested, and supported by so many independent observations and results, that their likelihood of subsequently being found to be wrong is vanishingly small. Such conclusions and theories are then regarded as settled facts. This is the case for the conclusions that the Earth system is warming and that much of this warming is very likely due to human activities. Among opponents of the mainstream scientific assessment, some say that while there is agreement that humans do have an effect on climate, there is no universal agreement about the quantitative magnitude of anthropogenic global warming (AGW) relative to natural forcings and its harm-to-benefit ratio. Other opponents assert that some kind of ill-defined "consensus argument" is being used, and then dismiss this by arguing that science is based on facts rather than consensus. Some highlight the dangers of focusing on only one viewpoint in the context of what they say is unsettled science, or point out that science is based on facts and not on opinion polls or consensus. Dennis T. Avery, a food policy analyst at the Hudson Institute, wrote an article titled "500 Scientists Whose Research Contradicts Man-Made Global Warming Scares" published in 2007, by The Heartland Institute. The list was immediately called into question for misunderstanding and distorting the conclusions of many of the named studies and citing outdated, flawed studies that had long been abandoned. Many of the scientists included in the list demanded their names be removed. The Heartland Institute refused these requests, stating that the scientists "have no right—legally or ethically—to demand that their names be removed from a bibliography composed by researchers with whom they disagree" despite the aforementioned falsification and refutation of much of the list. A 2010 paper in the Proceedings of the National Academy of Sciences analysed "1,372 climate researchers and their publication and citation data to show that (i) 97–98% of the climate researchers most actively publishing in the field support the tenets of ACC [anthropogenic climate change] outlined by the Intergovernmental Panel on Climate Change, and (ii) the relative climate expertise and scientific prominence of the researchers unconvinced of ACC are substantially below that of the convinced researchers". Judith Curry has said "This is a completely unconvincing analysis", whereas Naomi Oreskes said that the paper shows "the vast majority of working [climate] research scientists are in agreement [on climate change]... Those who don't agree, are, unfortunately—and this is hard to say without sounding elitist—mostly either not actually climate researchers or not very productive researchers." Jim Prall, one of the coauthors of the study, acknowledged "it would be helpful to have lukewarm [as] a third category." A 2013 study, published in the peer-reviewed journal Environmental Research Letters analyzed 11,944 abstracts from papers published in the peer-reviewed scientific literature between 1991 and 2011, identified by searching the ISI Web of Science citation index engine for the text strings "global climate change" or "global warming". The authors found that 3974 of the abstracts expressed a position on anthropogenic global warming, and that 97.1% of those endorsed the consensus that humans are causing global warming. The authors found that of the 11,944 abstracts, 3896 endorsed that consensus, 7930 took no position on it, 78 rejected the consensus, and 40 expressed uncertainty about it. In 2014, a letter from 52 leading skeptics was published by the Committee for Skeptical Inquiry supporting the scientific consensus and asking the media to stop referring to deniers as "skeptics." The letter clarified the skeptical opinion on climate and denial: "As scientific skeptics, we are well aware of political efforts to undermine climate science by those who deny reality but do not engage in scientific research or consider evidence that their deeply held opinions are wrong. The most appropriate word to describe the behavior of those individuals is 'denial'. Not all individuals who call themselves climate change skeptics are deniers. But virtually all deniers have falsely branded themselves as skeptics. By perpetrating this misnomer, journalists have granted undeserved credibility to those who reject science and scientific inquiry." The "standard" view of climate change has come to be defined by the reports of the IPCC, which is supported by many other science academies and scientific organizations. In 2001, sixteen of the world's national science academies made a joint statement on climate change, and gave their support for the IPCC. Opponents have generally attacked either the IPCC's processes, people or the Synthesis and Executive summaries; the full reports attract less attention. Some of the controversy and criticism has originated from experts invited by the IPCC to submit reports or serve on its panels. For example, Richard Lindzen has publicly dissented from IPCC positions. Christopher Landsea, a hurricane researcher, said of "the part of the IPCC to which my expertise is relevant" that "I personally cannot in good faith continue to contribute to a process that I view as both being motivated by pre-conceived agendas and being scientifically unsound," because of comments made at a press conference by Kevin Trenberth of which Landsea disapproved. Trenberth said "Landsea's comments were not correct"; the IPCC replied "individual scientists can do what they wish in their own rights, as long as they are not saying anything on behalf of the IPCC" and offered to include Landsea in the review phase of the AR4. Roger Pielke, Jr. commented "Both Landsea and Trenberth can and should feel vindicated... the IPCC accurately reported the state of scientific understandings of tropical cyclones and climate change in its recent summary for policy makers." In 2005, the House of Lords Economics Committee wrote, "We have some concerns about the objectivity of the IPCC process, with some of its emissions scenarios and summary documentation apparently influenced by political considerations." It doubted the high emission scenarios and said that the IPCC had "played-down" what the committee called "some positive aspects of global warming". The main statements of the House of Lords Economics Committee were rejected in the response made by the United Kingdom government and by the Stern Review. Contributing authors essentially are asked to contribute a little text at the beginning and to review the first two drafts. We have no control over editing decisions. Even less influence is granted the 2,000 or so reviewers. Thus, to say that 800 contributing authors or 2,000 reviewers reached consensus on anything describes a situation that is not reality. On 10 December 2008, a report was released by the U.S. Senate Committee on Environment and Public Works Minority members, under the leadership of the Senate's most vocal global warming skeptic Jim Inhofe. The timing of the report coincided with the UN global warming conference in Poznań, Poland. It says it summarizes scientific dissent from the IPCC. Many of its statements about the numbers of individuals listed in the report, whether they are actually scientists, and whether they support the positions attributed to them, have been disputed. While some critics have argued that the IPCC overstates likely global warming, others have made the opposite criticism. David Biello, writing in the Scientific American, argues that, because of the need to secure consensus among governmental representatives, the IPCC reports give conservative estimates of the likely extent and effects of global warming. Science editor Brooks Hanson states in a 2010 editorial: "The IPCC reports have underestimated the pace of climate change while overestimating societies' abilities to curb greenhouse gas emissions." Climate scientist James E. Hansen argues that the IPCC's conservativeness seriously underestimates the risk of sea-level rise on the order of meters—enough to inundate many low-lying areas, such as the southern third of Florida. Roger A. Pielke Sr. has also stated "Humans are significantly altering the global climate, but in a variety of diverse ways beyond the radiative effect of carbon dioxide. The IPCC assessments have been too conservative in recognizing the importance of these human climate forcings as they alter regional and global climate." Henderson-Sellers has collected comments from IPCC authors in a 2007 workshop revealing a number of concerns. She concluded, "Climate change research entered a new and different regime with the publication of the IPCC Fourth Assessment Report. There is no longer any question about ‘whether’ human activities are changing the climate; instead research must tackle the urgent questions of: ‘how fast?’; ‘with what impacts? '; and ‘what responses are needed?’"
2) and other greenhouse gases (GHGs) do not correlate with global warming. 2 increase cannot have come from the oceans, volcanoes, or the biosphere, and thus is not a response to rising temperatures as would be required if the same processes creating past lags were active now. Carbon dioxide accounts for about 390 parts per million by volume (ppm) of the Earth's atmosphere, increasing from 284 ppm in the 1830s to 387 ppm in 2009. Carbon dioxide contributes between 9 and 26% of the natural greenhouse effect. 2 levels and the glaciation are not synchronous, but rather that weathering associated with the uplift and erosion of the Appalachian Mountains greatly reduced atmospheric greenhouse gas concentrations and permitted the observed glaciation. As noted above, climate models are only able to simulate the temperature record of the past century when GHG forcing is included, being consistent with the findings of the IPCC which has stated that: "Greenhouse gas forcing, largely the result of human activities, has very likely caused most of the observed global warming over the last 50 years"
2 is often used for modelling studies. 2 concentration will not double since economies are becoming less reliant on carbon. CO2 in Earth's atmosphere if half of global-warming emissions are not absorbed. 2 well beyond 750 ppm with very dangerous consequences for climate change impacts. According to a 2006 paper from Lawrence Livermore National Laboratory, "the earth would warm by 8 degrees Celsius (14.4 degrees Fahrenheit) if humans use the entire planet's available fossil fuels by the year 2300." On 12 November 2015, NASA scientists reported that human-made carbon dioxide (CO2) continues to increase above levels not seen in hundreds of thousands of years: currently, about half of the carbon dioxide released from the burning of fossil fuels remains in the atmosphere and is not absorbed by vegetation and the oceans. 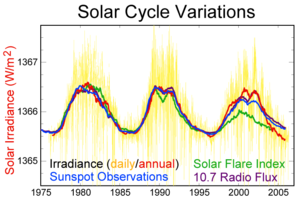 Last 30 years of solar variability. Scientists opposing the mainstream scientific assessment of global warming express varied opinions concerning the cause of global warming. Some say only that it has not yet been ascertained whether humans are the primary cause of global warming; others attribute global warming to natural variation; ocean currents; increased solar activity or cosmic rays. The consensus position is that solar radiation may have increased by 0.12 W/m2 since 1750, compared to 1.6 W/m2 for the net anthropogenic forcing. The TAR said, "The combined change in radiative forcing of the two major natural factors (solar variation and volcanic aerosols) is estimated to be negative for the past two, and possibly the past four, decades." The AR4 makes no direct assertions on the recent role of solar forcing, but the previous statement is consistent with the AR4's figure 4. A few studies say that the present level of solar activity is historically high as determined by sunspot activity and other factors. Solar activity could affect climate either by variation in the Sun's output or, more speculatively, by an indirect effect on the amount of cloud formation. Solanki and co-workers suggest that solar activity for the last 60 to 70 years may be at its highest level in 8,000 years, however they said "that solar variability is unlikely to have been the dominant cause of the strong warming during the past three decades", and concluded that "at the most 30% of the strong warming since then can be of solar origin". Muscheler et al. disagreed with the study, suggesting that other comparably high levels of activity have occurred several times in the last few thousand years. They concluded that "solar activity reconstructions tell us that only a minor fraction of the recent global warming can be explained by the variable Sun.". Another point of controversy is the correlation of temperature with solar variation. Mike Lockwood and Claus Fröhlich reject the statement that the warming observed in the global mean surface temperature record since about 1850 is the result of solar variations. Lockwood and Fröhlich conclude, "the observed rapid rise in global mean temperatures seen after 1985 cannot be ascribed to solar variability, whichever of the mechanisms is invoked and no matter how much the solar variation is amplified." [...] the direct aerosol effect had an approximately five times larger impact on climate forcing than the indirect aerosol and other cloud effects. The overall aerosol and cloud induced surface climate forcing is ~ 1 W m−2 decade−1 and has most probably strongly contributed to the recent rapid warming in Europe. There have been attempts to raise public controversy over the accuracy of the instrumental temperature record on the basis of the urban heat island effect, the quality of the surface station network, and assertions that there have been unwarranted adjustments to the temperature record. The 2001 IPCC Third Assessment Report (TAR) acknowledged that the urban heat island is an important local effect, but cited analyses of historical data indicating that the effect of the urban heat island on the global temperature trend is no more than 0.05 °C (0.09 °F) degrees through 1990. Peterson (2003) found no difference between the warming observed in urban and rural areas. Parker (2006) found that there was no difference in warming between calm and windy nights. Since the urban heat island effect is strongest for calm nights and is weak or absent on windy nights, this was taken as evidence that global temperature trends are not significantly contaminated by urban effects. Pielke and Matsui published a paper disagreeing with Parker's conclusions. In 2005, Roger A. Pielke and Stephen McIntyre criticized the US instrumental temperature record and adjustments to it, and Pielke and others criticized the poor quality siting of a number of weather stations in the United States. In 2007, Anthony Watts began a volunteer effort to photographically document the siting quality of these stations. The Journal of Geophysical Research – Atmospheres subsequently published a study by Menne et al. which examined the record of stations picked out by Watts' Surfacestations.org and found that, if anything, the poorly sited stations showed a slight cool bias rather than the warm bias which Watts had anticipated. The Berkeley Earth Surface Temperature group carried out an independent assessment of land temperature records, which examined issues raised by skeptics, such as the urban heat island effect, poor station quality, and the risk of data selection bias. The preliminary results, made public in October 2011, found that these factors had not biased the results obtained by NOAA, the Hadley Centre together with the Climatic Research Unit (HadCRUT) and NASA's GISS in earlier studies. The group also confirmed that over the past 50 years the land surface warmed by 0.911 °C, and their results closely matched those obtained from these earlier studies. The four papers they had produced had been submitted for peer review. General circulation models and basic physical considerations predict that in the tropics the temperature of the troposphere should increase more rapidly than the temperature of the surface. A 2006 report to the U.S. Climate Change Science Program noted that models and observations agreed on this amplification for monthly and interannual time scales but not for decadal time scales in most observed data sets. Improved measurement and analysis techniques have reconciled this discrepancy: corrected buoy and satellite surface temperatures are slightly cooler and corrected satellite and radiosonde measurements of the tropical troposphere are slightly warmer. Satellite temperature measurements show that tropospheric temperatures are increasing with "rates similar to those of the surface temperature", leading the IPCC to conclude that this discrepancy is reconciled. 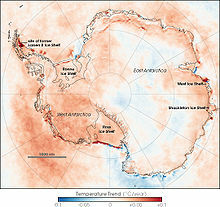 Antarctic Skin (the roughly top millimeter of land, sea, snow, or ice) temperature trends between 1981 and 2007, based on thermal infrared observations made by a series of NOAA satellite sensors; note that they do not necessarily reflect air temperature trends. There has been a public dispute regarding the apparent contradiction in the observed behavior of Antarctica, as opposed to the global rise in temperatures measured elsewhere in the world. This became part of the public debate in the global warming controversy, particularly between advocacy groups of both sides in the public arena, as well as the popular media. In contrast to the popular press, there is no evidence of a corresponding controversy in the scientific community. Observations unambiguously show the Antarctic Peninsula to be warming. The trends elsewhere show both warming and cooling but are smaller and dependent on season and the timespan over which the trend is computed. A study released in 2009, combined historical weather station data with satellite measurements to deduce past temperatures over large regions of the continent, and these temperatures indicate an overall warming trend. One of the paper's authors stated "We now see warming is taking place on all seven of the earth's continents in accord with what models predict as a response to greenhouse gases." According to 2011 paper by Ding, et al., "The Pacific sector of Antarctica, including both the Antarctic Peninsula and continental West Antarctica, has experienced substantial warming in the past 30 years." This controversy began with the misinterpretation of the results of a 2002 paper by Doran et al., which found "Although previous reports suggest slight recent continental warming, our spatial analysis of Antarctic meteorological data demonstrates a net cooling on the Antarctic continent between 1966 and 2000, particularly during summer and autumn." Later the controversy was popularized by Michael Crichton's 2004 fiction novel State of Fear, who advocated skepticism in global warming. This novel has a docudrama plot based upon the idea that there is a deliberately alarmist conspiracy behind global warming activism. One of the characters argues "data show that one relatively small area called the Antarctic Peninsula is melting and calving huge icebergs... but the continent as a whole is getting colder, and the ice is getting thicker." As a basis for this plot twist, Crichton cited the peer reviewed scientific article by Doran, et al. Peter Doran, the lead author of the paper cited by Crichton, stated "... our results have been misused as 'evidence' against global warming by Crichton in his novel 'State of Fear'... 'Our study did find that 58 percent of Antarctica cooled from 1966 to 2000. But during that period, the rest of the continent was warming. And climate models created since our paper was published have suggested a link between the lack of significant warming in Antarctica and the ozone hole over that continent." 2 concentration above pre-industrial levels". In its 2007 Fourth Assessment Report, IPCC said that climate sensitivity is "likely to be in the range 2 to 4.5 °C with a best estimate of about 3 °C". 2, estimated to be 1.6 K ± 0.4 K.
2 emissions will increase temperatures by lower values than those estimated by the climate models used by the IPCC was featured in news outlets including The Economist. This premature announcement came from a preliminary news release about a study which had not yet been peer reviewed. The Center for International Climate and Environmental Research, Oslo (CICERO) issued a statement that they were involved with the relevant research project, and the news story was based on a report submitted to the research council which included both published and unpublished material. The highly publicised figures came from work still undergoing peer review, and CICERO would wait until they had been published in a journal before disseminating the results. Roy Spencer et al. suggested "a net reduction in radiative input into the ocean-atmosphere system" in tropical intraseasonal oscillations "may potentially support" the idea of an "Iris" effect, although they point out that their work is concerned with much shorter time scales. Other analyses have found that the iris effect is a positive feedback rather than the negative feedback proposed by Lindzen. James Hansen's 1984 climate model projections versus observed temperatures are updated each year by Dr Mikako Sato of Columbia University. 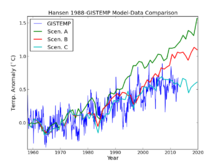 The RealClimate website provides an annual update comparing both Hansen's 1988 model projections and the IPCC Fourth Assessment Report (AR4) climate model projections with observed temperatures recorded by GISS and HadCRUT. The measured temperatures show continuing global warming. Conventional projections of future temperature rises depend on estimates of future anthropogenic GHG emissions (see SRES), those positive and negative climate change feedbacks that have so far been incorporated into the models, and the climate sensitivity. Models referenced by the Intergovernmental Panel on Climate Change (IPCC) predict that global temperatures are likely to increase by 1.1 to 6.4 °C (2.0 to 11.5 °F) between 1990 and 2100. 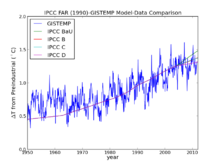 Others have proposed that temperature increases may be higher than IPCC estimates. One theory is that the climate may reach a "tipping point" where positive feedback effects lead to runaway global warming; such feedbacks include decreased reflection of solar radiation as sea ice melts, exposing darker seawater, and the potential release of large volumes of methane from thawing permafrost. In 1959, Dr. Bert Bolin, in a speech to the National Academy of Sciences, predicted that by the year 2000, there would be a 25% increase in carbon dioxide in the atmosphere compared to the levels in 1859. The actual increase by 2000 was about 29%. David Orrell or Henk Tennekes say that climate change cannot be accurately predicted. Orrell says that the range of future increase in temperature suggested by the IPCC rather represents a social consensus in the climate community, but adds "we are having a dangerous effect on the climate". A 2007 study by David Douglass and coworkers, concluded that the 22 most commonly used global climate models used by the IPCC were unable to accurately predict accelerated warming in the troposphere although they did match actual surface warming, concluding "projections of future climate based on these models should be viewed with much caution". This result went against a similar study of 19 models which found that discrepancies between model predictions and actual temperature were likely due to measurement errors. In a NASA report published in January 2013, Hansen and Sato noted "the 5-year mean global temperature has been flat for a decade, which we interpret as a combination of natural variability and a slowdown in the growth rate of the net climate forcing." Ed Hawkins, of the University of Reading, stated that the "surface temperatures since 2005 are already at the low end of the range of projections derived from 20 climate models. If they remain flat, they will fall outside the models' range within a few years." Using the long-term temperature trends for the earth scientists and statisticians conclude that it continues to warm through time. Certain scientists, skeptics and otherwise, believe this confidence in the models' ability to predict future climate is not earned. Following the (then) record low of the arctic sea ice extend in 2007, Mark Serreze, the director of US National Snow and Ice Data Center, stated "If you asked me a couple of years ago when the Arctic could lose all of its ice then I would have said 2100, or 2070 maybe. But now I think that 2030 is a reasonable estimate." In 2012, during another record low, Peter Wadhams of Cambridge University predicted a possible final collapse of Arctic sea ice in summer months around 2016. Antarctic and Arctic sea ice extent are available on a daily basis from the National Snow & Ice Data Center. Scientific journals and funding agencies generally require authors of peer-reviewed research to provide information on archives of data and share sufficient data and methods necessary for a scientific expert on the topic to reproduce the work. In political controversy over the 1998 and 1999 historic temperature reconstructions widely publicised as the "hockey stick graphs", Mann, Bradley and Hughes as authors of the studies were sent letters on 23 June 2005 from Rep. Joe Barton, chairman of the House Committee on Energy and Commerce and Ed Whitfield, Chairman of the Subcommittee on Oversight and Investigations, demanding full records on the research. The letters told the scientist to provide not just data and methods, but also personal information about their finances and careers, information about grants provided to the institutions they had worked for, and the exact computer codes used to generate their results. Sherwood Boehlert, chairman of the House Science Committee, told his fellow Republican Joe Barton it was a "misguided and illegitimate investigation" seemingly intended to "intimidate scientists rather than to learn from them, and to substitute congressional political review for scientific review". The U.S. National Academy of Sciences (NAS) president Ralph J. Cicerone wrote to Barton proposing that the NAS should appoint an independent panel to investigate. Barton dismissed this offer. On 15 July, Mann wrote giving his detailed response to Barton and Whitfield. He emphasised that the full data and necessary methods information was already publicly available in full accordance with National Science Foundation (NSF) requirements, so that other scientists had been able to reproduce their work. NSF policy was that computer codes are considered the intellectual property of researchers and are not subject to disclosure, but notwithstanding these property rights, the program used to generate the original MBH98 temperature reconstructions had been made available at the Mann et al. public FTP site. Many scientists protested about Barton's demands. Alan I. Leshner wrote to him on behalf of the American Association for the Advancement of Science stating that the letters gave "the impression of a search for some basis on which to discredit these particular scientists and findings, rather than a search for understanding", He stated that Mann, Bradley and Hughes had given out their full data and descriptions of methods. A Washington Post editorial on 23 July which described the investigation as harassment quoted Bradley as saying it was "intrusive, far-reaching and intimidating", and Alan I. Leshner of the AAAS describing it as unprecedented in the 22 years he had been a government scientist; he thought it could "have a chilling effect on the willingness of people to work in areas that are politically relevant". Congressman Boehlert said the investigation was as "at best foolhardy" with the tone of the letters showing the committee's inexperience in relation to science. Barton was given support by global warming sceptic Myron Ebell of the Competitive Enterprise Institute, who said "We've always wanted to get the science on trial ... we would like to figure out a way to get this into a court of law," and "this could work". In his Junk Science column on Fox News, Steven Milloy said Barton's inquiry was reasonable. In September 2005 David Legates alleged in a newspaper op-ed that the issue showed climate scientists not abiding by data access requirements and suggested that legislators might ultimately take action to enforce them. The SPM [Summary for policymakers] was approved line by line by governments[...] The argument here is that the scientists determine what can be said, but the governments determine how it can best be said. Negotiations occur over wording to ensure accuracy, balance, clarity of message, and relevance to understanding and policy. The IPCC process is dependent on the good will of the participants in producing a balanced assessment. However, in Shanghai, it appeared that there were attempts to blunt, and perhaps obfuscate, the messages in the report, most notably by Saudi Arabia. This led to very protracted debates over wording on even bland and what should be uncontroversial text... The most contentious paragraph in the IPCC (2001) SPM was the concluding one on attribution. After much debate, the following was carefully crafted: "In the light of new evidence, and taking into account the remaining uncertainties, most of the observed warming over the last 50 years is likely to have been due to the increase in greenhouse-gas concentrations." The other point that leads to major controversy—because it could have significant economic impacts—is whether action (usually, restrictions on the use of fossil fuels to reduce carbon-dioxide emissions) should be taken now, or in the near future; and whether those restrictions would have any meaningful effect on global temperature. Because of the economic ramifications of such restrictions, there are those, including the Cato Institute, a libertarian think tank, who argue that the negative economic effects of emission controls outweigh the environmental benefits. They state that even if global warming is caused solely by the burning of fossil fuels, restricting their use would have more damaging effects on the world economy than the increases in global temperature. On a local or regional level, some specific effects of global warming might be considered beneficial. Council on Foreign Relations senior fellow Walter Russell Mead argues that the 2009 Copenhagen Summit failed because environmentalists have changed from "Bambi to Godzilla". According to Mead, environmentalist used to represent the skeptical few who made valid arguments against big government programs which tried to impose simple but massive solutions on complex situations. Environmentalists' more recent advocacy for big economic and social intervention against global warming, according to Mead, has made them, "the voice of the establishment, of the tenured, of the technocrats" and thus has lost them the support of a public which is increasingly skeptical of global warming. Various campaigns such as 350.org and many Greenpeace projects have been started in an effort to push the world's leaders towards changing laws and policies that would effectively reduce the world's carbon emissions and use of non-renewable energy resources. 2e. Nevertheless, China is the world's second largest producer of greenhouse gas emissions, and India 4th (see: countries by greenhouse emissions). Various predictions see China overtaking the US in total greenhouse emissions between late 2007 and 2010, and according to many other estimates, this already occurred in 2006. Additionally, high costs of decreasing emissions may cause significant production to move to countries that are not covered under the treaty, such as India and China, says Fred Singer. As these countries are less energy efficient, this scenario is said[by whom? ]to cause additional carbon emissions. In May 2010 the Hartwell Paper was published by the London School of Economics in collaboration with the University of Oxford. This paper was written by 14 academics from various disciplines in the sciences and humanities, and also some policies thinkers, and they argued that the Kyoto Protocol crashed in late 2009 and "has failed to produce any discernable real world reductions in emissions of greenhouse gases in fifteen years." They argued that this failure opened an opportunity to set climate policy free from Kyoto and the paper advocates a controversial and piecemeal approach to decarbonization of the global economy. The Hartwell paper proposes, "the organising principle of our effort should be the raising up of human dignity via three overarching objectives: ensuring energy access for all; ensuring that we develop in a manner that does not undermine the essential functioning of the Earth system; ensuring that our societies are adequately equipped to withstand the risks and dangers that come from all the vagaries of climate, whatever their cause may be". The only major developed nation which has signed but not ratified the Kyoto protocol is the US (see signatories). The countries with no official position on Kyoto are mainly African countries with underdeveloped scientific infrastructure or are oil producers. The Global Climate Coalition was an industry coalition that funded several scientists who expressed skepticism about global warming. In the year 2000, several members left the coalition when they became the target of a national divestiture campaign run by John Passacantando and Phil Radford at Ozone Action. According to The New York Times, when Ford Motor Company was the first company to leave the coalition, it was "the latest sign of divisions within heavy industry over how to respond to global warming". After that, between December, 1999 and early March, 2000, the GCC was deserted by Daimler-Chrysler, Texaco, energy firm the Southern Company and General Motors. The Global Climate Coalition closed in 2002, or in their own words, 'deactivated'. Documents obtained by Greenpeace under the US Freedom of Information Act show that the Charles G. Koch Foundation gave climate change writer Willie Soon two grants totaling $175,000 in 2005/6 and again in 2010. Multiple grants to Soon from the American Petroleum Institute between 2001 and 2007, totalled $274,000, and from ExxonMobil totalled $335,000 between 2005 and 2010. Other coal and oil industry sources which funded him include the Mobil Foundation, the Texaco Foundation and the Electric Power Research Institute. Soon, acknowledging that he received this money, stated unequivocally that he has "never been motivated by financial reward in any of my scientific research". In February 2015, Greenpeace disclosed papers documenting that Soon failed to disclose to academic journals funding including more than $1.2 million from fossil fuel industry related interests including ExxonMobil, the American Petroleum Institute, the Charles G. Koch Charitable Foundation and the Southern Company. To investigate how widespread such hidden funding was, senators Barbara Boxer, Edward Markey and Sheldon Whitehouse wrote to a number of companies. Koch general counsel refused the request and said it would infringe the company's first amendment rights. The Greenpeace research project ExxonSecrets, and George Monbiot writing in The Guardian, as well as various academics, have linked several skeptical scientists—Fred Singer, Fred Seitz and Patrick Michaels—to organizations funded by ExxonMobil and Philip Morris for the purpose of promoting global warming skepticism. These organizations include the Cato Institute and the Heritage Foundation. Similarly, groups employing global warming skeptics, such as the George C. Marshall Institute, have been criticized for their ties to fossil fuel companies. On 2 February 2007, The Guardian stated that Kenneth Green, a Visiting Scholar with AEI, had sent letters to scientists in the UK and the U.S., offering US$10,000 plus travel expenses and other incidental payments in return for essays with the purpose of "highlight[ing] the strengths and weaknesses of the IPCC process", specifically regarding the IPCC Fourth Assessment Report. The Union of Concerned Scientists produced a report titled 'Smoke, Mirrors & Hot Air', that criticizes ExxonMobil for "underwriting the most sophisticated and most successful disinformation campaign since the tobacco industry" and for "funnelling about $16 million between 1998 and 2005 to a network of ideological and advocacy organizations that manufacture uncertainty on the issue". In 2006, Exxon said that it was no longer going to fund these groups though that statement has been challenged by Greenpeace. The Center for the Study of Carbon Dioxide and Global Change, a skeptic group, when confronted about the funding of a video they put together ($250,000 for "The Greening of Planet Earth" from an oil company) stated, "We applaud Western Fuels for their willingness to publicize a side of the story that we believe to be far more correct than what at one time was 'generally accepted'. But does this mean that they fund The Center? Maybe it means that we fund them!" Donald Kennedy, editor-in-chief of Science, has said that skeptics such as Michaels are lobbyists more than researchers, and "I don't think it's unethical any more than most lobbying is unethical," he said. He said donations to skeptics amounts to "trying to get a political message across". Global warming skeptic Reid Bryson said in June 2007, "There is a lot of money to be made in this... If you want to be an eminent scientist you have to have a lot of grad students and a lot of grants. You can't get grants unless you say, 'Oh global warming, yes, yes, carbon dioxide'." Similar positions have been advanced by University of Alabama, Huntsville climate scientist Roy Spencer, Spencer's University of Alabama, Huntsville colleague and IPCC contributor John Christy, University of London biogeographer Philip Stott, Accuracy in Media, and Ian Plimer in his 2009 book Heaven and Earth — Global Warming: The Missing Science. Richard Lindzen, the Alfred P. Sloan Professor of Meteorology at MIT, said, "[in] the winter of 1989 Reginald Newell, a professor of meteorology [at MIT], lost National Science Foundation funding for data analyses that were failing to show net warming over the past century." Lindzen also suggested that four other scientists "apparently" lost their funding or positions after questioning the scientific underpinnings of global warming. Lindzen himself has been the recipient of money from energy interests such as OPEC and the Western Fuels Association, including "$2,500 a day for his consulting services", as well as funding from US federal sources including the National Science Foundation, the Department of Energy, and NASA. In recent years some skeptics have changed their positions regarding global warming. Ronald Bailey, author of Global Warming and Other Eco-Myths (published by the Competitive Enterprise Institute in 2002), stated in 2005, "Anyone still holding onto the idea that there is no global warming ought to hang it up." By 2007, he wrote "Details like sea level rise will continue to be debated by researchers, but if the debate over whether or not humanity is contributing to global warming wasn't over before, it is now.... as the new IPCC Summary makes clear, climate change Pollyannaism is no longer looking very tenable." "There are alternatives to its [the climate-change crusade's] insistence that the only appropriate policy response is steep and immediate emissions reductions.... a greenhouse-gas-emissions cap ultimately would constrain energy production. A sensible climate policy would emphasize building resilience into our capacity to adapt to climate changes.... we should consider strategies of adaptation to a changing climate. A rise in the sea level need not be the end of the world, as the Dutch have taught us." says Steven F. Hayward of American Enterprise Institute, a conservative think-tank. Hayward also advocates the use of "orbiting mirrors to rebalance the amounts of solar radiation different parts of the earth receive"—the space sunshade example of so-called geoengineering for solar radiation management. 2 emissions, said that responses needed to be prioritised. "You can't just say, 'No matter what the cost, and no matter how little the benefit, we'll do this'. If we truly believe in warming, then we've already decided we're going to adjust...The reason we adjust to things far better than Bangladesh is that we're richer. Wouldn't you think it makes sense to make sure we're as robust and wealthy as possible? And that the poor of the world are also as robust and wealthy as possible?" 2 emissions and consumption of fossil fuels. Large developing nations such as India and China are predicted to be major emitters of greenhouse gases in the next few decades as their economies grow. The adaptation-only plan is also endorsed by oil companies like ExxonMobil, "ExxonMobil's plan appears to be to stay the course and try to adjust when changes occur. The company's plan is one that involves adaptation, as opposed to leadership," says this Ceres report. Gregg Easterbrook characterized himself as having "a long record of opposing alarmism". In 2006, he stated, "based on the data I'm now switching sides regarding global warming, from skeptic to convert." Despite conceding that our consumption of fossil fuels is causing serious damage and despite implying that current policy is inadequate, the Report fails to take the next step and recommend serious alternatives. Rather, it suggests that we simply need to accommodate to the coming changes. For example, reminiscent of former Interior Secretary Hodel's proposal that the government address the hole in the ozone layer by encouraging Americans to make better use of sunglasses, suntan lotion and broad-brimmed hats, the Report suggests that we can deal with heat-related health impacts by increased use of air-conditioning ... Far from proposing solutions to the climate change problem, the Administration has been adopting energy policies that would actually increase greenhouse gas emissions. Notably, even as the Report identifies increased air conditioner use as one of the 'solutions' to climate change impacts, the Department of Energy has decided to roll back energy efficiency standards for air conditioners. Some find this shift and attitude disingenuous and indicative of an inherent bias against prevention (i.e. reducing emissions/consumption) and for the prolonging of profits to the oil industry at the expense of the environment. "Now that the dismissal of climate change is no longer fashionable, the professional deniers are trying another means of stopping us from taking action. It would be cheaper, they say, to wait for the impacts of climate change and then adapt to them" says writer and environmental activist George Monbiot in an article addressing the supposed economic hazards of addressing climate change. Others argue that adaptation alone will not be sufficient. See also Copenhagen Consensus. Though not emphasized to the same degree as mitigation, adaptation to a climate certain to change has been included as a necessary component in the discussion as early as 1992, and has been all along. However it was not to the exclusion, advocated by the skeptics, of preventative mitigation efforts, and therein, say carbon cutting proponents, lies the difference. Another highly debated potential climate change mitigation strategy is Cap and Trade due to its direct relationship with the economy. In November 2016, the Paris Agreement went into effect. Many climate scientists state that they are put under enormous pressure to distort or hide any scientific results which suggest that human activity is to blame for global warming. A survey of climate scientists which was reported to the US House Oversight and Government Reform Committee in 2007, noted "Nearly half of all respondents perceived or personally experienced pressure to eliminate the words 'climate change', 'global warming' or other similar terms from a variety of communications." These scientists were pressured to tailor their reports on global warming to fit the Bush administration's climate change scepticism. In some cases, this occurred at the request of former oil-industry lobbyist Phil Cooney, who worked for the American Petroleum Institute before becoming chief of staff at the White House Council on Environmental Quality (he resigned in 2005, before being hired by ExxonMobil). In June 2008, a report by NASA's Office of the Inspector General concluded that NASA staff appointed by the White House had censored and suppressed scientific data on global warming in order to protect the Bush administration from controversy close to the 2004 presidential election. U.S. officials, such as Philip Cooney, have repeatedly edited scientific reports from US government scientists, many of whom, such as Thomas Knutson, have been ordered to refrain from discussing climate change and related topics. Attempts to suppress scientific information on global warming and other issues have been described by journalist Chris Mooney in his book The Republican War on Science. Climate scientist James E. Hansen, director of NASA's Goddard Institute for Space Studies, wrote in a widely cited New York Times article in 2006, that his superiors at the agency were trying to "censor" information "going out to the public". NASA denied this, saying that it was merely requiring that scientists make a distinction between personal, and official government, views in interviews conducted as part of work done at the agency. Several scientists working at the National Oceanic and Atmospheric Administration have made similar complaints; once again, government officials said they were enforcing long-standing policies requiring government scientists to clearly identify personal opinions as such when participating in public interviews and forums. The BBC's long-running current affairs series Panorama recently investigated the issue, and was told, "scientific reports about global warming have been systematically changed and suppressed." Scientists who agree with the consensus view have sometimes expressed concerns over what they view as sensationalism of global warming by interest groups and the press. For example, Mike Hulme, director of the Tyndall Centre for Climate Research, wrote how increasing use of pejorative terms like "catastrophic", "chaotic" and "irreversible", had altered the public discourse around climate change: "This discourse is now characterised by phrases such as 'climate change is worse than we thought', that we are approaching 'irreversible tipping in the Earth's climate', and that we are 'at the point of no return'. I have found myself increasingly chastised by climate change campaigners when my public statements and lectures on climate change have not satisfied their thirst for environmental drama and exaggerated rhetoric." Climate scientists at seven government agencies say they have been subjected to political pressure aimed at downplaying the threat of global warming. Critics writing in The Wall Street Journal editorial page state that the survey was itself unscientific. In addition to the pressure from politicians, many prominent scientists working on climate change issues have reported increasingly severe harassment from members of the public. The harassment has taken several forms. The US FBI told ABC News that it was looking into a spike in threatening emails sent to climate scientists, while a white supremacist website posted pictures of several climate scientists with the word "Jew" next to each image. One climate scientist interviewed by ABC News had a dead animal dumped on his doorstep and now frequently has to travel with bodyguards. In April 2010, Virginia Attorney General Ken Cuccinelli claimed that leading climate scientist Michael E. Mann had possibly violated state fraud laws, and without providing any evidence of wrongdoing, filed the Attorney General of Virginia's climate science investigation as a civil demand that the University of Virginia provide a wide range of records broadly related to five research grants Mann had obtained as an assistant professor at the university from 1999 to 2005. This litigation was widely criticized in the academic community as politically motivated and likely to have a chilling effect on future research. The university filed a court petition and the judge dismissed Cuccinelli's demand on the grounds that no justification had been shown for the investigation. Cuccinelli issued a revised subpoena, and appealed the case to the Virginia Supreme Court which ruled in March 2012 that Cuccinelli did not have the authority to make these demands. The outcome was hailed as a victory for academic freedom. Exxon Mobil is also notorious for skewing scientific evidence through their private funding of scientific organizations. In 2002, Exxon Mobil contributed $10,000 to The Independent Institute and then $10,000 more in 2003. In 2003, The Independent Institute release a study that reported the evidence for imminent global warming found during the Clinton administration was based on now-dated satellite findings and wrote off the evidence and findings as a product of "bad science". This is not the only consortium of skeptics that Exxon Mobil has supported financially. The George C. Marshall Institute received $630,000 in funding for climate change research from ExxonMobil between 1998 and 2005. Exxon Mobil also gave $472,000 in funding to The Board of Academic and Scientific Advisors for the Committee for a Constructive Tomorrow from 1998 to 2005. Dr. Frederick Seitz, well known as "the godfather of global warming skepticism", served as both Chairman Emeritus of The George C. Marshall Institute and a board member of the Committee for a Constructive Tomorrow from 1998 to 2005. Several lawsuits have been filed over global warming. For example, Massachusetts v. Environmental Protection Agency before the Supreme Court of the United States allowed the EPA to regulate greenhouse gases under the Clean Air Act. A similar approach was taken by California Attorney General Bill Lockyer who filed a lawsuit California v. General Motors Corp. to force car manufacturers to reduce vehicles' emissions of carbon dioxide. This lawsuit was found to lack legal merit and was tossed out. A third case, Comer v. Murphy Oil USA, Inc., a class action lawsuit filed by Gerald Maples, a trial attorney in Mississippi, in an effort to force fossil fuel and chemical companies to pay for damages caused by global warming. Described as a nuisance lawsuit, it was dismissed by District Court. However, the District Court's decision was overturned by the United States Court of Appeals for the Fifth Circuit, which instructed the District Court to reinstate several of the plaintiffs' climate change-related claims on 22 October 2009. The Sierra Club sued the U.S. government over failure to raise automobile fuel efficiency standards, and thereby decrease carbon dioxide emissions. In a lawsuit organized by activist organization Our Children's Trust, a group of plaintiffs aged 8–19 sued the U. S. Federal Government, claiming "the government has known for decades that carbon dioxide (CO2) pollution has been causing catastrophic climate change and has failed to take necessary action to curtail fossil fuel emissions." On April 8, 2016, U. S. Magistrate Judge Thomas Coffin denied defendant's motion to dismiss, arguing plaintiffs have standing to sue because they will be disproportionately affected by the alleged damages. "The intractability of the debates before Congress and state legislatures and the alleged valuing of short term economic interest despite the cost to human life," argued Coffin, "necessitates a need for the courts to evaluate the constitutional parameters of the action or inaction taken by the government". ^ 2009 Ends Warmest Decade on Record. NASA Earth Observatory Image of the Day, 22 January 2010. ^ Oreskes, Naomi (December 2004). "Beyond the Ivory Tower: The Scientific Consensus on Climate Change". Science. 306 (5702): 1686. doi:10.1126/science.1103618. PMID 15576594. Such statements suggest that there might be substantive disagreement in the scientific community about the reality of anthropogenic climate change. This is not the case. [...] Politicians, economists, journalists, and others may have the impression of confusion, disagreement, or discord among climate scientists, but that impression is incorrect. ^ America's Climate Choices: Panel on Advancing the Science of Climate Change; National Research Council (2010). Advancing the Science of Climate Change. Washington, D.C.: The National Academies Press. ISBN 978-0-309-14588-6. Archived from the original on 29 May 2014. Retrieved 19 February 2014. (p1) ... there is a strong, credible body of evidence, based on multiple lines of research, documenting that climate is changing and that these changes are in large part caused by human activities. While much remains to be learned, the core phenomenon, scientific questions, and hypotheses have been examined thoroughly and have stood firm in the face of serious scientific debate and careful evaluation of alternative explanations. * * * (p21-22) Some scientific conclusions or theories have been so thoroughly examined and tested, and supported by so many independent observations and results, that their likelihood of subsequently being found to be wrong is vanishingly small. Such conclusions and theories are then regarded as settled facts. This is the case for the conclusions that the Earth system is warming and that much of this warming is very likely due to human activities. ^ "Understanding and Responding to Climate Change" (PDF). United States National Academy of Sciences. 2008. Archived from the original (PDF) on 23 April 2013. Retrieved 30 May 2010. Most scientists agree that the warming in recent decades has been caused primarily by human activities that have increased the amount of greenhouse gases in the atmosphere. ^ Lovejoy, Shaun; Chipello, Chris (11 April 2014). "Is global warming just a giant natural fluctuation?". McGill University. Retrieved 17 April 2014. ^ Lovejoy, S. (April 2014). "Scaling fluctuation analysis and statistical hypothesis testing of anthropogenic warming". Climate Dynamics. 42 (9–10): 2339–2351. Bibcode:2014ClDy...42.2339L. doi:10.1007/s00382-014-2128-2. ^ "Climate Change 2013: The Physical Science Basis. IPCC Fifth Assessment Report, Working Group I, Summary for Policymakers. "The best estimate of the human-induced contribution to warming is similar to the observed warming over this period."" (PDF). Archived from the original (PDF) on 22 October 2018. Retrieved 26 December 2018. ^ Julie Brigham-Grette; et al. (September 2006). "Petroleum Geologists' Award to Novelist Crichton Is Inappropriate". Eos. 87 (36): 364. Bibcode:2006EOSTr..87..364B. doi:10.1029/2006EO360008. The AAPG stands alone among scientific societies in its denial of human-induced effects on global warming. ^ DiMento, Joseph F. C.; Doughman, Pamela M. (2007). Climate Change: What It Means for Us, Our Children, and Our Grandchildren. The MIT Press. p. 68. ISBN 978-0-262-54193-0. ^ "Scientific consensus: Earth's climate is warming". Climate Change: Vital Signs of the Planet. Retrieved 2018-09-16. ^ Boykoff, M.; Boykoff, J. (July 2004). "Balance as bias: global warming and the US prestige press" (PDF). Global Environmental Change Part A. 14 (2): 125–136. doi:10.1016/j.gloenvcha.2003.10.001. Archived from the original (PDF) on 6 November 2015. ^ a b Oreskes, Naomi; Conway, Erik (2010-05-25). Merchants of Doubt: How a Handful of Scientists Obscured the Truth on Issues from Tobacco Smoke to Global Warming (first ed.). Bloomsbury Press. ISBN 978-1-59691-610-4. ^ Committee on Surface Temperature Reconstructions for the Last 2,000 Years and National Research Council (2006). Surface Temperature Reconstructions for the Last 2,000 Years. Washington, D.C.: The National Academies. ISBN 978-0-309-10225-4. Retrieved 4 May 2013. ^ Public Support for Climate and Energy Policies in March 2012 (PDF). Yale Project on Climate Change Communication:. 2012. ^ a b "Canvassing Works". Canvassing Works. Retrieved 19 July 2013. ^ a b Vidal, John (27 June 2011). "Climate sceptic Willie Soon received $1m from oil companies, papers show". The Guardian. London. ^ McCright, A. M.; Dunlap R. E. (2000). "Challenging global warming as a social problem: An analysis of the conservative movement's counter-claims" (PDF). Social Problems. 47 (4): 499–522. doi:10.2307/3097132. JSTOR 3097132. See p. 500. ^ Speech to the Royal Society (27 September 1988), Public Statement, Speech Archive, Margaret Thatcher Foundation. Retrieved 9 April 2007. ^ Carvalho, Anabela (2007). "Ideological cultures and media discourses on scientific knowledge". Public Understanding of Science. 16 (2): 223–43. doi:10.1177/0963662506066775. ^ Harvey, Fiona (9 May 2013). "Charles: 'Climate change sceptics are turning Earth into dying patient'". The Guardian. London. Retrieved 10 May 2013. ^ Mintzer, Irving M. (1992). Confronting climate change. Cambridge University Press. pp. 265–272. ISBN 978-0-521-42091-4. ^ "USEIA U.S. Energy-Related Carbon Dioxide Emissions, 2012". 21 October 2013. ^ Bodansky, Daniel (2001). "The History of the Global Climate Change Regime" (PDF). In Luterbacher, Urs; Sprinz, Detlef F. International Relations and Global Climate Change. The MIT Press. pp. 23–40. Archived from the original (PDF) on 27 March 2014. Retrieved 22 November 2016. ^ Crampton, Thomas (4 January 2007). "More in Europe worry about climate than in U.S., poll shows". International Herald Tribune. Retrieved 14 April 2007. ^ "Little Consensus on Global Warming – Partisanship Drives Opinion – Summary of Findings". Pew Research Center for the People and the Press. 12 July 2006. Retrieved 14 April 2007. ^ TNS Opinion and Social (December 2009). "Europeans' Attitudes Towards Climate Change" (Full free text). European Commission. Retrieved 24 December 2009. ^ Black, Richard (5 September 2007). "BBC switches off climate special". BBC. Retrieved 15 December 2011. ^ BBC drops climate change special. The Guardian. 5 September 2007. Retrieved 15 December 2011. ^ Weart, Spencer (2006). "The Public and Climate Change". In Weart, Spencer. The Discovery of Global Warming. American Institute of Physics. ISBN 978-0-674-01157-1. Retrieved 14 April 2007. ^ a b Langer, Gary (26 March 2006). "Poll: Public Concern on Warming Gains Intensity". ABC News. Retrieved 12 April 2007. ^ a b c GlobeScan and the Program on International Policy Attitudes at University of Maryland (25 September 2007). "Man causing climate change – poll". BBC World Service. Retrieved 25 September 2007. ^ Program on International Policy Attitudes (5 April 2006). "30-Country Poll Finds Worldwide Consensus that Climate Change is a Serious Problem". Program on International Policy Attitudes. Archived from the original on 13 October 2007. Retrieved 20 April 2007. ^ a b Pew Research Center: "Public Praises Science; Scientists Fault Public, Media" 9 July 2009. ^ Tipping Point or Turning Point? Social Marketing & Climate Change (3Mb pdf) Archived 15 February 2010 at the Wayback Machine, by Ipsos Mori, July 2007. ^ David Suzuki (18 August 2006). "Public doesn't understand global warming". David Suzuki Foundation. Archived from the original on 16 August 2007. Retrieved 18 August 2007. ^ "11th Hour Film". Retrieved 2017-02-24. ^ "An Inconvenient Truth (Movie)". Al Gore. Retrieved 2017-02-24. ^ Richard J. Bord; Ann Fisher; Robert E. O'Connor (1997). "Is Accurate Understanding of Global Warming Necessary to Promote Willingness to Sacrifice?". Archived from the original on 27 September 2007. Retrieved 29 February 2008. ^ No Global Warming Alarm in the U.S., China Archived 1 December 2007 at the Wayback Machine 15-Nation Pew Global Attitudes Survey, released 13 June 2006. ^ Rising Environmental Concern in 47-Nation Survey Archived 12 January 2010 at the Wayback Machine. Pew Global Attitudes. Released 27 June 2007. ^ "Most discussions on climate change ignore these 10 basic facts about human nature". 2015-06-14. Retrieved 9 May 2016. ^ "Psychologists Are Learning How to Convince Conservatives to Take Climate Change Seriously". October 2014. Retrieved 9 May 2016. ^ a b "Climate scepticism 'on the rise', BBC poll shows". BBC News. 7 February 2010. ^ "Only 2 per cent of Canadians don't believe in climate change: poll". The Globe and Mail. Toronto. 15 August 2012. ^ Peter Jacques (2009). Environmental skepticism: ecology, power and public life. Global environmental governance series. Ashgate Publishing, Ltd. ISBN 978-0-7546-7102-2. ^ George E. Brown (March 1997). "Environmental Science Under Siege in the U.S. Congress". Environment: Science and Policy for Sustainable Development. 39 (2): 12–31. doi:10.1080/00139159709604359. ^ "NEW ON THE SEPP WEB". Archived from the original on 15 February 2007. Retrieved 23 May 2007. ^ Pielke Jr., Roger A. (10 January 2005). "Accepting Politics In Science". The Washington Post. p. A17. Retrieved 24 April 2007. ^ Egan, Timothy (November 5, 2015). "Exxon Mobil and the G.O.P. : Fossil Fools". The New York Times. Retrieved November 9, 2015. ^ Goldenberg, Suzanne (July 8, 2015). "Exxon knew of climate change in 1981, email says – but it funded deniers for 27 more years". The Guardian. Retrieved November 9, 2015. ^ Oreskes, Naomi (3 December 2004). "The Scientific Consensus on Climate Change". Science. 306 (5702): 1686. doi:10.1126/science.1103618. ISSN 0036-8075. PMID 15576594. ^ Doran, Peter T.; Zimmerman, Maggie Kendall (20 January 2009). "Examining the Scientific Consensus on Climate Change". Eos, Transactions American Geophysical Union. 90 (3): 22–23. Bibcode:2009EOSTr..90...22D. doi:10.1029/2009EO030002. ISSN 2324-9250. ^ a b Anderegg W.R.L. ; Prall J.W. ; Harold J.; Schneider S.H. (21 June 2010). "Expert credibility in climate change". Proceedings of the National Academy of Sciences of the United States of America. 107 (27): 12107–9. Bibcode:2010PNAS..10712107A. doi:10.1073/pnas.1003187107. PMC 2901439. PMID 20566872. ^ Verheggen, Bart; Strengers, Bart; Cook, John; van Dorland, Rob; Vringer, Kees; Peters, Jeroen; Visser, Hans; Meyer, Leo (19 August 2014). "Scientists' Views about Attribution of Global Warming". Environmental Science & Technology. 48 (16): 8963–8971. Bibcode:2014EnST...48.8963V. doi:10.1021/es501998e. ISSN 0013-936X. PMID 25051508. ^ Stenhouse, Neil; Maibach, Edward; Cobb, Sara; Ban, Ray; Bleistein, Andrea; Croft, Paul; Bierly, Eugene; Seitter, Keith; Rasmussen, Gary; Leiserowitz, Anthony (8 November 2013). "Meteorologists' Views About Global Warming: A Survey of American Meteorological Society Professional Members". Bulletin of the American Meteorological Society. 95 (7): 1029–1040. Bibcode:2014BAMS...95.1029S. doi:10.1175/BAMS-D-13-00091.1. ISSN 0003-0007. ^ Carlton, J. S.; Perry-Hill, Rebecca; Huber, Matthew; Prokopy, Linda S. (1 January 2015). "The climate change consensus extends beyond climate scientists". Environmental Research Letters. 10 (9): 094025. Bibcode:2015ERL....10i4025C. doi:10.1088/1748-9326/10/9/094025. ISSN 1748-9326. ^ Powell, James Lawrence (1 October 2015). "Climate Scientists Virtually Unanimous Anthropogenic Global Warming Is True". Bulletin of Science, Technology & Society. 35 (5–6): 121–124. doi:10.1177/0270467616634958. ISSN 0270-4676. ^ a b Joint statement of sixteen National Academies of Science (18 May 2001). "The Science of Climate Change". The Royal Society. Retrieved 20 May 2009. The work of the Intergovernmental Panel on Climate Change (IPCC) represents the consensus of the international scientific community on climate change science. We recognise IPCC as the world's most reliable source of information on climate change and its causes, and we endorse its method of achieving this consensus. Despite increasing consensus on the science underpinning predictions of global climate change, doubts have been expressed recently about the need to mitigate the risks posed by global climate change. We do not consider such doubts justified. ^ Union of Concerned Scientists. "World Scientists Call For Action". Archived from the original on 12 October 2007. Projections indicate that demand for food in Asia will exceed the supply by 2010. ^ Union Of Concerned Scientists (2 October 1997). "World's Nobel Laureates And Preeminent Scientists Call On Government Leaders To Halt Global Warming". Science Daily. Retrieved 9 February 2010. ^ "List of Selected Prominent Signatories with awards and affiliations". Dieoff.org. Retrieved 29 August 2010. ^ America's Climate Choices: Panel on Advancing the Science of Climate Change; National Research Council (2010). Advancing the Science of Climate Change. Washington, D.C.: The National Academies Press. pp. 1 & 21–22. ISBN 978-0-309-14588-6. Archived from the original on 29 May 2014. Retrieved 19 February 2014. ^ Dr. Roy W., Spencer (2010). The Great Global Warming Blunder. Encounter Books. ISBN 978-1-59403-373-5. ^ Carter, Professor Robert M. (2010). Climate: The Counter Consensus. pp. 191–210. ^ Crichton, Michael (17 January 2003). "Lecture at CalTech: "Aliens Cause Global Warming"". Archived from the original on 1 January 2006. Retrieved 14 April 2007. ^ Monbiot, George (8 December 2009). "The Real Climate Scandal". The Guardian. Archived from the original on 12 December 2009. ^ Monbiot, George (9 December 2009). "The climate denial industry seeks to dupe the public. It's working". The Hindu. Retrieved 3 September 2010. ^ Do 500 scientists refute the consensus? ^ a b c Kintisch E. (21 June 2010). "Scientists 'Convinced' of Climate Consensus More Prominent Than Opponents, Says Paper". Science. Archived from the original on 22 June 2010. ^ Collins, Nick (22 June 2010). "Climate change sceptic scientists 'less prominent and authoritative'". The Daily Telegraph. London. p. 1. Retrieved 22 June 2010. ^ "Deniers are not Skeptics". Skeptical Inquirer. 2014. ^ Oreskes, Naomi (20 December 2007). "The American Denial of Global Warming—The Truth About Denial". Perspectives on Ocean Science—UCSD-TV. YouTube. Retrieved 29 August 2010. In 1995, the IPCC concluded that the human effect on climate is now discernible. The lead author of the key chapter on detection and attribution...was a scientist of the Lawrence Livermore National Laboratory named Benjamin J. Santer. They followed this with an op-ed piece in The Wall Street Journal titled "A Major Deception on Global Warming". This piece was written by Seitz, in which he states that the effect of the changes was "to deceive policy makers and the public". Now Santer replied, in a letter to the editor of The Wall Street Journal, and in the response he explained that he had made changes, but those changes were in response to the peer review process. In other words, totally normal scientific practice...This account was corroborated by the Chairman of the IPCC and by all of the other authors of the chapters. In fact, over 40 scientists were co-authors of this chapter. This letter was signed by Santer and 40 others and published in The Wall Street Journal in June 1996. And Santer was also formally defended by the American Meteorological Society. But neither Seitz nor Singer ever retracted the charges, which was then repeated—many times, over and over again—by industry groups and think-tanks. And in fact, if you google "Ben Santer", these same charges are still in the Internet today. In fact, one site said that it was proven in 1996 that Santer had fraudulently altered the IPCC report. ^ "A Case Against Precipitous Climate Action". 15 January 2011. Archived from the original on 19 January 2011. Retrieved 16 February 2011. ^ "An Open Letter to the Community from Chris Landsea". Archived from the original on 18 February 2007. Retrieved 28 April 2007. ^ a b "Prometheus: Final Chapter, Hurricanes and IPCC, Book IV Archives". Sciencepolicy.colorado.edu. 14 February 2007. Retrieved 29 August 2010. ^ "Hurricanes and Global Warming for IPCC" (PDF). Washington. Reuters. 21 October 2004. Retrieved 30 December 2008. ^ "Final Climate Change Report" (PDF). Retrieved 29 December 2008. ^ The Committee Office, House of Lords (28 November 2005). "House of Lords — Economic Affairs — Third Report". Publications.parliament.uk. Retrieved 29 August 2010. ^ "Written testimony of John R. Christy Ph.D. before House Committee on Energy and Commerce on March 7, 2007" (PDF). Archived from the original (PDF) on 2007-11-28. Retrieved 29 December 2008. ^ Biello D (April 2007). "Conservative Climate". Scientific American. 296 (4): 16–19. Bibcode:2007SciAm.296d..16B. doi:10.1038/scientificamerican0407-16. PMID 17479619. ^ Hanson, Brooks (7 May 2010). "Stepping Back; Moving Forward". Science. 328 (5979): 667. Bibcode:2010Sci...328..667H. doi:10.1126/science.1190790. PMID 20448154. Retrieved 23 May 2010. ^ Hansen JE (April–June 2007). "Scientific reticence and sea level rise". Environmental Research Letters. 2 (2): 024002. arXiv:physics/0703220. Bibcode:2007ERL.....2b4002H. doi:10.1088/1748-9326/2/2/024002. ^ "Climate Science: Main Conclusions". Archived from the original on 11 December 2008. Retrieved 11 December 2008. ^ Henderson-Sellers, Ann. "The IPCC report: what the lead authors really think — environmentalresearchweb". Archived from the original on 6 January 2009. Retrieved 24 December 2009. ^ Idso, C. D.; K. E. Idso. "Carbon Dioxide and Global Warming — Where We Stand on the Issue". CO2Science. Archived from the original on 10 April 2007. Retrieved 13 April 2007. ^ Barkov, N.I. (February 2003). "Historical carbon dioxide record from the Vostok ice core". Carbon Dioxide Information Analysis Center. Archived from the original on 6 March 2007. Retrieved 13 March 2007. ^ Kuo, C.; Lindberg, C.; Thomson, D.J. (22 February 1990). "Coherence established between atmospheric carbon dioxide and global temperature". Nature. 343 (6260): 709–714. Bibcode:1990Natur.343..709K. doi:10.1038/343709a0. ^ Weart, Spencer (2006). "Past Cycles: Ice Age Speculations". In Weart, Spencer. The Discovery of Global Warming. American Institute of Physics. ISBN 978-0-674-01157-1. Retrieved 14 April 2007. ^ "More Notes on Global Warming". Physics Today. May 2005. Archived from the original on 11 August 2007. Retrieved 10 September 2007. ^ Tans, Pieter. "Trends in Carbon Dioxide". NOAA/ESRL. Retrieved 11 December 2009. 2 levels". Journal of Geophysical Research. 100 (D1): 1093–1102. Bibcode:1995JGR...100.1093C. doi:10.1029/94JD02521. ^ Gorder, Pam Frost (25 October 2006). "Appalachian Mountains, carbon dioxide caused long-ago global cooling". Ohio State University Research news. Archived from the original on 7 March 2007. Retrieved 13 April 2007. ^ Hegerl; et al. "Chapter 9 Understanding and Attributing Climate Change". Climate Change 2007: The Physical Science Basis. Contribution of Working Group I to the Fourth Assessment Report of the Intergovernmental Panel on Climate Change [permanent dead link] (pdf Archived 7 July 2011 at the Wayback Machine), in (IPCC AR4 WG1 2007). ^ IPCC (2001). "2.3 Global Futures Scenarios". Climate Change 2001:Synthesis Report. Archived from the original on 4 March 2016 . ^ a b Buis, Alan; Ramsayer, Kate; Rasmussen, Carol (12 November 2015). "A Breathing Planet, Off Balance". NASA. Retrieved 13 November 2015. ^ a b Staff (12 November 2015). "Audio (66:01) - NASA News Conference - Carbon & Climate Telecon". NASA. Retrieved 12 November 2015. ^ a b St. Fleur, Nicholas (10 November 2015). "Atmospheric Greenhouse Gas Levels Hit Record, Report Says". The New York Times. Retrieved 11 November 2015. ^ a b Ritter, Karl (9 November 2015). "UK: In 1st, global temps average could be 1 degree C higher". AP News. Retrieved 11 November 2015. ^ IPCC. "Summary for Policymakers". Climate Change 2007: The Physical Science Basis. Contribution of Working Group I to the Fourth Assessment Report of the Intergovernmental Panel on Climate Change. Human and Natural Drivers of Climate Change , in IPCC AR4 SYR 2007. ^ IPCC. "Summary for Policymakers". Climate Change 2001: Working Group I: The Scientific Basis. Natural factors have made small contributions to radiative forcing over the past century , in IPCC TAR WG1 2001. ^ Muscheler, Raimund; Joos, Fortunat; Müller, Simon A.; Snowball, Ian (2005). "How unusual is today's solar activity? Arising from: S. K. Solanki, I. G. Usoskin, B. Kromer, M. Schüssler and J. Beer, Nature, 2004, 431, 1084–1087" (PDF). Nature. 436 (7050): E3–E4. Bibcode:2005Natur.436E...3M. doi:10.1038/nature04045. PMID 16049429. Archived from the original (PDF) on 8 January 2006. ^ Leidig, Michael; Nikkhah, Roya (17 July 2004). "The truth about global warming – it's the Sun that's to blame". The Daily Telegraph. London. Retrieved 12 April 2007. ^ "Space Weather/Solar Activity and Climate". DMI Solar-Terrestrial Physics Division. 19 October 1998. Archived from the original on 21 May 2007. Retrieved 13 April 2007. ^ a b Lockwood, Mike; Lockwood, Claus (2007). "Recent oppositely directed trends in solar climate forcings and the global mean surface air temperature" (PDF). Proceedings of the Royal Society A. 463 (2086): 2447–2460. Bibcode:2007RSPSA.463.2447L. doi:10.1098/rspa.2007.1880. Archived from the original (PDF) on 26 September 2007. Retrieved 21 July 2007. There are many interesting palaeoclimate studies that suggest that solar variability had an influence on pre-industrial climate. There are also some detection–attribution studies using global climate models that suggest there was a detectable influence of solar variability in the first half of the twentieth century and that the solar radiative forcing variations were amplified by some mechanism that is, as yet, unknown. However, these findings are not relevant to any debates about modern climate change. Our results show that the observed rapid rise in global mean temperatures seen after 1985 cannot be ascribed to solar variability, whichever of the mechanisms is invoked and no matter how much the solar variation is amplified. ^ Mitchell; et al. "Chapter 12. Detection of Climate Change and Attribution of Causes". Climate Change 2001: Working Group I: The Scientific Basis. Sec. 12.4.3.3 Space-time studies , in IPCC TAR WG1 2001. ^ Mitchell, J. F. B.; Johns, T. C. (1997). "On Modification of Global Warming by Sulfate Aerosols". Journal of Climate. 10 (2): 245–267. Bibcode:1997JCli...10..245M. doi:10.1175/1520-0442(1997)010<0245:OMOGWB>2.0.CO;2. ISSN 1520-0442. ^ Ruckstuhl, C.; et al. (2008). "Aerosol and cloud effects on solar brightening and the recent rapid warming". Geophysical Research Letters. 35 (12): L12708. Bibcode:2008GeoRL..3512708R. doi:10.1029/2008GL034228. ^ "EPA's Denial of the Petitions To Reconsider the Endangerment and Cause or Contribute Findings for Greenhouse Gases Under Section 202(a) of the Clean Air Act". Federal Register. 2010-08-13. Retrieved 2017-02-02. ^ Morano, Marc (2015-11-04). "No global warming at all for 18 years 9 months – a new record – The Pause lengthens again – just in time for UN Summit in Paris". Climate Depot. Retrieved 2017-02-02. ^ Folland; et al. "Chapter 2: Observed Climate Variability and Change". Climate Change 2001: Working Group I: The Scientific Basis. Sec. 2.2 How Much is the World Warming?. Archived from the original on 6 October 2014 , in IPCC TAR WG1 2001. ^ Peterson, Thomas C. (2003). "Assessment of urban versus rural in situ surface temperatures in the contiguous United States: no difference found. Journal of Climate". Journal of Climate (Submitted manuscript). 16 (18): 2941–59. Bibcode:2003JCli...16.2941P. doi:10.1175/1520-0442(2003)016<2941:AOUVRI>2.0.CO;2. ISSN 1520-0442. ^ David, Parker (2006). "A demonstration that large-scale warming is not urban". Journal of Climate. 19 (12): 2882–95. Bibcode:2006JCli...19.2882P. CiteSeerX 10.1.1.543.2675. doi:10.1175/JCLI3730.1. ^ Pielke Sr., R.A.; T. Matsui (2005). "Should light wind and windy nights have the same temperature trends at individual levels even if the boundary layer averaged heat content change is the same?" (PDF). Geophysical Research Letters. 32 (21): L21813. Bibcode:2005GeoRL..3221813P. doi:10.1029/2005GL024407. Archived from the original (PDF) on 10 September 2008. ^ Davey, Christopher A.; Pielke Sr., Roger A. (2005). "Microclimate Exposures of Surface-Based Weather Stations: Implications For The Assessment of Long-Term Temperature Trends" (PDF). Bulletin of the American Meteorological Society. 86 (4): 497–504. Bibcode:2005BAMS...86..497D. doi:10.1175/BAMS-86-4-497. Archived from the original (PDF) on 10 September 2008. ^ Mahmood, Rezaul; Stuart A. Foster; David Logan (2006). "The GeoProfile metadata, exposure of instruments, and measurement bias in climatic record revisited". International Journal of Climatology. 26 (8): 1091–1124. Bibcode:2006IJCli..26.1091M. doi:10.1002/joc.1298. ^ "Fiddler On The Roof". Investor's Business Daily. 22 June 2007. Archived from the original on 15 August 2007. ^ Menne, Matthew J.; Claude N. Williams, Jr.; Michael A. Palecki (2010). "On the reliability of the U.S. surface temperature record" (PDF). Journal of Geophysical Research. 115 (D11): D11108. Bibcode:2010JGRD..11511108M. doi:10.1029/2009JD013094. In summary, we find no evidence that the CONUS average temperature trends are inflated due to poor station siting...The reason why station exposure does not play an obvious role in temperature trends probably warrants further investigation. ^ Cook, John (27 January 2010). "Climate sceptics distract us from the scientific realities of global warming". The Guardian. London. Retrieved 5 February 2010. ^ Jeff Tollefson (20 October 2011). "Different method, same result: global warming is real". Nature News. doi:10.1038/news.2011.607. Archived from the original on 14 January 2012. Retrieved 22 October 2011. ^ "Cooling the Warming Debate: Major New Analysis Confirms That Global Warming Is Real". Science Daily. 21 October 2011. Retrieved 22 October 2011. ^ Ian Sample (20 October 2011). "Global warming study finds no grounds for climate sceptics' concerns". The Guardian. London. Retrieved 22 October 2011. ^ "Climate change: The heat is on". The Economist. 22 October 2011. Retrieved 22 October 2011. ^ Santer, B. D.; Thorne, P. W.; Haimberger, L.; K. E. Taylor; T. M. L. Wigley; J. R. Lanzante; S. Solomon; M. Free; P. J. Gleckler; P. D. Jones; T. R. Karl; S. A. Klein; C. Mears; D. Nychka; G. A. Schmidt; S. C. Sherwood; F. J. Wentz (2008). "Consistency of modelled and observed temperature trends in the tropical troposphere" (PDF). International Journal of Climatology. 28 (13): 1703–22. Bibcode:2008IJCli..28.1703S. doi:10.1002/joc.1756. ^ IPCC. "Summary for Policymakers". Climate Change 2007: The Physical Science Basis. Contribution of Working Group I to the Fourth Assessment Report of the Intergovernmental Panel on Climate Change. Direct Observations of Recent Climate Change , in IPCC AR4 WG1 2007. ^ Davidson, Keay (4 February 2002). "Media goofed on Antarctic data / Global warming interpretation irks scientists". San Francisco Chronicle. Retrieved 13 April 2013. ^ Peter N. Spotts (18 January 2002). "Guess what? Antarctica's getting colder, not warmer". The Christian Science Monitor. Retrieved 13 April 2013. ^ Chang, Kenneth (3 May 2002). "Ozone Hole Is Now Seen as a Cause for Antarctic Cooling". The New York Times. Retrieved 13 April 2013. ^ "America Reacts To Speech Debunking Media Global Warming Alarmism". U.S. Senate Committee on Environment and Public Works. 28 September 2006. Archived from the original on 5 March 2013. Retrieved 13 April 2013. ^ Bijal P. Trivedi (25 January 2002). "Antarctica Gives Mixed Signals on Warming". National Geographic. Retrieved 13 April 2013. ^ Derbyshire, David (14 January 2002). "Antarctic cools in warmer world". The Daily Telegraph. London. Retrieved 13 April 2013. ^ "Scientific winds blow hot and cold in Antarctica". CNN. 25 January 2002. Archived from the original on 9 June 2012. Retrieved 13 April 2013. ^ Chang, Kenneth (2 April 2002). "The Melting (Freezing) of Antarctica; Deciphering Contradictory Climate Patterns Is Largely a Matter of Ice". The New York Times. Retrieved 13 April 2013. ^ Chapman WL, Walsh JE (2007). "A Synthesis of Antarctic Temperatures". Journal of Climate. 20 (16): 4096–4117. Bibcode:2007JCli...20.4096C. doi:10.1175/JCLI4236.1. ^ Kenneth Chang (21 January 2009). "Warming in Antarctica Looks Certain". The New York Times. Archived from the original on 13 November 2014. Retrieved 13 April 2013. ^ Ding, Qinghua; Eric J. Steig; David S. Battisti; Marcel Küttel (10 April 2011). "Winter warming in West Antarctica caused by central tropical Pacific warming". Nature Geoscience. 4 (6): 398–403. Bibcode:2011NatGe...4..398D. CiteSeerX 10.1.1.459.8689. doi:10.1038/ngeo1129. Retrieved 12 January 2012. ^ "Antarctic cooling pushing life closer to the edge". USA Today. 16 January 2002. Retrieved 13 April 2013. ^ a b c Doran PT; Priscu JC; Lyons WB; et al. (January 2002). "Antarctic climate cooling and terrestrial ecosystem response" (PDF). Nature. 415 (6871): 517–20. doi:10.1038/nature710. PMID 11793010. Archived from the original (PDF) on 11 December 2004. ^ Michael Crichton (28 September 2005). "Statement of Michael Crichton, M.D. – The Role of Science in Environmental Policy-Making". U.S. Senate Committee on Environment and Public Works. Retrieved 13 April 2013. Testimony before the Committee on Environment and Public Works, Washington, D.C.
^ Peter Doran (27 July 2006). "Cold, Hard Facts". The New York Times. Retrieved 13 August 2013. ^ IPCC, Glossary A-D: "Climate Sensitivity", in IPCC AR4 SYR 2007. ^ "SYR 2.3: Climate sensitivity and feedbacks". Archived from the original on 24 May 2016. Retrieved 26 December 2018. ^ Schwartz, Stephen E. (2007). "Heat Capacity, Time Constant and Sensitivity of Earth's Climate System" (PDF). Journal of Geophysical Research. 112 (D24): D24S05. Bibcode:2007JGRD..11224S05S. doi:10.1029/2007JD008746. Archived from the original (PDF) on 28 September 2007. Retrieved 10 September 2007. ^ Chylek, P.; Lohmann, U.; Dubey, M.; Mishchenko, M.; Kahn, R. (2007). "Aerosol Optical Depth, Climate Sensitivity and Global Warming". AGU Fall Meeting Abstracts. 2007: A21H–04. Bibcode:2007AGUFM.A21H..04C. ^ a b c "A sensitive matter". The Economist. 30 March 2013. Retrieved 7 April 2013. ^ The Research Council of Norway (25 January 2013). "Global Warming Less Extreme Than Feared? New Estimates from a Norwegian Project On Climate Calculations". Science Daily. Retrieved 7 April 2013. ^ Revkin, Andrew (28 January 2013). "When Publicity Precedes Peer Review in Climate Science". The New York Times DotEarth blog. Retrieved 22 July 2013. ^ "Unpublished estimates of climate sensitivity". CICERO. 28 January 2013. Archived from the original on 26 June 2013. Retrieved 22 July 2013. ^ Richard S. Lindzen; Ming-Dah Chou; Arthur Y. Hou (March 2001). "Does the Earth Have an Adaptive Infrared Iris?" (PDF). Bulletin of the American Meteorological Society. 82 (3): 417–432. Bibcode:2001BAMS...82..417L. doi:10.1175/1520-0477(2001)082<0417:DTEHAA>2.3.CO;2. ^ Bing Lin; Bruce A. Wielicki; Lin H. Chambers; Yongxiang Hu; Kuan-Man Xu (2002). "The iris hypothesis: a negative or positive cloud feedback?". Journal of Climate. 15 (1): 3–7. Bibcode:2002JCli...15....3L. doi:10.1175/1520-0442(2002)015<0003:TIHANO>2.0.CO;2. ISSN 1520-0442. ^ Steve Connor (16 September 2005). "Global Warming 'Past the Point of No Return'". The Independent. Archived from the original on 3 February 2007. Retrieved 7 September 2007. ^ Lawrence Solomon. "The limits of predictability". Archived from the original on 23 July 2013. Retrieved 23 July 2013. ^ David Orrell. "Frequently asked questions on Apollo's Arrow/The Future of Everything, by David Orrell". Retrieved 11 September 2007. ^ J. Hansen; M. Sato; R. Ruedy (15 January 2013). "Global Temperature Update Through 2012" (PDF). NASA. Retrieved 7 April 2013. ^ David Roberts (August 26, 2016). "Scientist finds clever new way to represent same old depressing climate trends". vox.com. Vox. Retrieved August 30, 2016. ^ Stott, P., Good, P., Jones, G., Gillett, N. and Hawkins, E (2013). "The upper end of climate model temperature projections is inconsistent with past warming". Environmental Research Letters. 8 (1): 014024. Bibcode:2013ERL.....8a4024S. doi:10.1088/1748-9326/8/1/014024. CS1 maint: Multiple names: authors list (link) Available on line here , see Figure 4. ^ Kesten C. Greene; J. Scott Armstrong (2007). "Global Warming: Forecasts by Scientists Versus Scientific Forecasts" (PDF). Energy & Environment. 18 (7): 997–1021. doi:10.1260/095830507782616887. Archived from the original (PDF) on 20 June 2010. ^ William Chapman (9 August 2007). 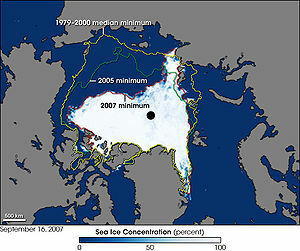 "New historic sea ice minimum". The Cryosphere Today. Retrieved 11 September 2007. ^ David Adam (4 September 2007). "Loss of Arctic ice leaves experts stunned". The Guardian. London. Retrieved 7 September 2007. ^ Vidal, John (17 September 2012). "Climate change (Environment),Environment,Sea ice (environment),Polar regions (Environment),Arctic (News),World news, Geoengineering (environment),Carbon emissions (Environment),Climate change (Science),Science". The Guardian. London. ^ Richard Monastersky (1 July 2005). "Congressman Demands Complete Records on Climate Research by 3 Scientists Who Support Theory of Global Warming — Archives". The Chronicle of Higher Education. Retrieved 4 March 2011. ^ "The Committee on Energy and Commerce, Joe Barton, Chairman". Letters Requesting Information Regarding Global Warming Studies. U.S. House of Representatives. 23 June 2005. Archived from the original on 10 April 2011. Retrieved 4 March 2011. ^ Joe Barton; Ed Whitfield (23 June 2005). "letter to Dr. Michael Mann" (PDF). United States House Committee on Energy and Commerce. Archived from the original (PDF) on 7 February 2012. Retrieved 4 March 2011. ^ a b editorial (23 July 2005). "Hunting Witches". The Washington Post. Retrieved 4 March 2011. ^ a b Juliet Eilperin (18 July 2005). "GOP Chairmen Face Off on Global Warming". The Washington Post. Retrieved 4 March 2011. ^ Henry A. Waxman (1 July 2005). "Letter to Chairman Barton" (PDF). Henry Waxman House of Representatives website. Archived from the original (PDF) on 14 March 2012. Retrieved 4 March 2011. ^ Michael E. Mann (15 July 2005). "Letter to Chairman Barton and Chairman Whitfield" (PDF). RealClimate. Archived from the original (PDF) on 27 July 2011. Retrieved 4 March 2011. Gavin Schmidt; Stefan Rahmstorf (18 July 2005). "Scientists respond to Barton". RealClimate. Retrieved 4 March 2011. ^ 20 scientists as listed (15 July 2005). "letter to Chairman Barton and Chairman Whitfield" (PDF). RealClimate. Archived from the original (PDF) on 27 July 2011. Retrieved 4 March 2011. ^ a b c Roland Pease (18 July 2005). "Science/Nature | Politics plays climate 'hockey'". BBC News. Retrieved 4 March 2011. ^ Alan I. Leshner (13 July 2005). "www.aaas.org" (PDF). American Association for the Advancement of Science. Archived from the original (PDF) on 28 February 2011. Retrieved 4 March 2011. ^ Steven Milloy (31 July 2005). "Tree Ring Circus". Fox News. Archived from the original on 8 February 2011. Retrieved 9 March 2011. ^ "The Weekly Closer from U.S. Senate, September 23, 2005" (PDF). Archived from the original (PDF) on 28 November 2007. Retrieved 29 December 2008. ^ Mascaro, Lisa (12 February 2007). "GOP still cool on global warming". Las Vegas Sun. Archived from the original on 2 January 2010. Retrieved 14 April 2007. ^ Trenberth, Kevin (2001). "The IPCC Assessment of global warming 2001". Journal of the Forum for Environmental Law, Science, Engineering, and Finance (8–26). Archived from the original (Scholar search) on 6 December 2006. Retrieved 19 February 2014. ^ "What's up with the weather: the debate: Stephen H. Schneider". Nova and Frontline. PBS. Retrieved 13 April 2007. ^ "Global Warming, the Anatomy of a Debate: A speech by Jerry Taylor of the Cato Institute". Archived from the original on 24 January 2012. ^ a b "What's up with the weather: the debate: Fred Palmer". Nova and Frontline. PBS. Retrieved 13 April 2007. ^ Nicholas Stern (2006). "7. Projecting the Growth of Greenhouse-Gas Emissions". In Stern, Nicolas. Stern Review: The Economics of Climate Change (– Scholar search). HM Treasury, Cambridge University Press. ISBN 978-0-521-70080-1. Archived from the original (PDF) on 24 October 2007. Retrieved 19 February 2014. ^ Palmer, Brian (30 January 2012). "Global warming would harm the Earth, but some areas might find it beneficial". The Washington Post. ^ Will, George, "When Bambi becomes Godzilla Archived 9 September 2010 at the Wayback Machine", The Denver Post, 5 September 2010. ^ Darragh, Ian (1998). "A Guide to Kyoto: Climate Change and What it Means to Canadians: Does the Kyoto treaty go far enough... or too far?" (PDF). International Institute for Sustainable Development. Retrieved 14 April 2007. ^ Catherine Brahic (25 April 2007). "China's emissions may surpass the US in 2007". New Scientist. Archived from the original on 27 April 2007. Retrieved 20 May 2007. ^ Saeed Shah (8 November 2006). "China to pass US greenhouse gas levels by 2010". The Independent. London. Archived from the original on 30 September 2007. Retrieved 20 May 2007. ^ "China fears disasters, grain cut from global warming". AlertNet. Reuters. 27 December 2006. Retrieved 20 May 2007. 2 emissions; US in second position Netherlands Environmental Assessment Agency. Retrieved 20 June 2007. 2 emitter". The Guardian. London. Retrieved 9 February 2010. ^ Singer, S. Fred (24 May 2000). Climate Policy – From Rio to Kyoto: A Political Issue for 2000—and Beyond. Essays in Public Policy, No. 102. Stanford University: Hoover Institution. p. 49. ISBN 978-0-8179-4372-1. Archived from the original on 29 September 2007. Retrieved 13 April 2007. ^ a b c Prins, Gwyn et. al (May 2010). "The Hartwell Paper – A new direction for climate policy after the crash of 2009" (PDF). London School of Economics. Retrieved 12 May 2010. ^ a b "Oblique strategies". The Economist. 11 May 2010. Retrieved 12 May 2010. ^ a b "Do You Heart 'The Hartwell Paper'?". Science Insider. 12 May 2010. Archived from the original on 28 May 2010. Retrieved 12 May 2010. ^ Bradsher, Keith (7 December 1999). "Ford Announces Its Withdrawal From Global Climate Coalition". The New York Times. Retrieved 21 July 2013. ^ "GCC Suffers Technical Knockout, Industry defections decimate Global Climate Coalition". ^ "globalclimate.org". Global Climate. 19 April 2003. Archived from the original on 19 April 2003. ^ Brahic, Catherine (February 25, 2015). "Climate change sceptic's work called into question". New Scientist. Retrieved March 17, 2015. ^ McCoy, Terrence (February 23, 2015). "Things just got very hot for climate deniers' favorite scientist". Washington Post. Retrieved March 17, 2015. ^ Gillis, Justin; Schwartz, John (February 21, 2015). "Deeper Ties to Corporate Cash for Doubtful Climate Researcher". The New York Times. Retrieved 2015-02-21. ^ Yuhas, Alan (13 Mar 2015). "Koch Industries refuses to comply with US senators' climate investigation". The Guardian. Retrieved 17 Apr 2015. ^ Naomi Oreskes; Erik Conway (2010). Merchants of Doubt: How a Handful of Scientists Obscured the Truth on Issues from Tobacco Smoke to Global Warming. US: Bloomsbury. ISBN 978-1-59691-610-4. ^ Clive Hamilton (2010). Requiem for a Species: Why We Resist the Truth about Climate Change. Allen & Unwin. pp. 103–105. ISBN 978-1-74237-210-5. Retrieved 19 February 2014. ^ Monbiot, George (19 September 2006). "The denial industry". London: The Guardian. Retrieved 11 August 2007. By May 1993, as another memo from APCO to Philip Morris shows, the fake citizens' group had a name: the Advancement of Sound Science Coalition. ^ Adam, David (27 January 2005). "Oil firms fund climate change 'denial'". The Guardian. London. Retrieved 14 April 2007. ^ Sample, Ian (2 February 2007). "Scientists offered cash to dispute climate study". The Guardian. London. Retrieved 14 April 2007. ^ "Climate Controversy and AEI: Facts and Fictions". American Enterprise Institute for Public Policy Research. 9 February 2007. Archived from the original on 13 April 2007. Retrieved 14 April 2007. ^ Hayward, Steven F.; Kenneth Green (5 July 2006). "AEI Letter to Pf. Schroeder" (PDF). Archived from the original (PDF) on 8 February 2007. Retrieved 14 April 2007. ^ "Lewandowski memo" (PDF). Retrieved 29 December 2008. ^ "Smoke, Mirrors & Hot Air – How ExxonMobil Uses Big Tobacco's Tactics to Manufacture Uncertainty on Climate Science". Union of Concerned Scientists. January 2007. Archived from the original on 10 April 2007. Retrieved 14 April 2007. ^ "Links". Western Fuels. Archived from the original on 15 January 2006. Retrieved 13 April 2007. ^ Borenstein, Seth (27 July 2006). "Utilities Paying Global Warming Skeptic". CBS News from Associated Press. Archived from the original on 3 March 2007. Retrieved 14 April 2007. ^ Real Clear Politics: Hooey Denier Deniers. 24 June 2007. ^ "Must-See Global Warming TV". Fox News. March 2007. Archived from the original on 17 May 2007. Retrieved 14 May 2007. ^ Plimer, Ian (2009). Heaven and Earth:Global Warming, the Missing Science. Australia: Connor Court Publication. ^ "Climate of Fear". OpinionJournal.com. April 2006. Retrieved 14 May 2007. ^ Gelbspan, Ross (December 1995). "The Heat Is On: The warming of the world's climate sparks a blaze of denial". Harper's Magazine. Retrieved 8 February 2008. ^ Lindzen, Richard S.; Constantine Giannitsis (2002). "Reconciling observations of global temperature change" (PDF). Geophysical Research Letters. 29 (12): 24&#45, 1–24&#45, 3. Bibcode:2002GeoRL..29.1583L. doi:10.1029/2001GL014074. Retrieved 10 September 2007. ^ Ronald Bailey (11 August 2005). "We're All Global Warmers Now". Reason Online. Archived from the original on 24 October 2006. Retrieved 27 April 2008. ^ Bailey, Ronald (2 February 2007). "Global Warming—Not Worse Than We Thought, But Bad Enough". Reason. Retrieved 13 April 2007. ^ Hayward, Steven F. (15 May 2006). "Acclimatizing – How to Think Sensibly, or Ridiculously, about Global Warming". American Enterprise Institute. Archived from the original on 4 February 2007. Retrieved 13 April 2007. ^ "How Dangerous Is Global Warming?". Los Angeles Times. 17 June 2001. Archived from the original on 1 October 2007. Retrieved 14 April 2007. ^ Keller, Michelle (15 February 2005). "World to celebrate Kyoto Protocol start". The Stanford Daily. Archived from the original on 27 September 2007. Retrieved 14 April 2007. ^ Harrison, Paul; Pearce, Fred (2000). "Foreword by Peter H. Raven". In Victoria Dompka Markham. AAAS Atlas of Population & Environment. American Association for the Advancement of Science & University of California Press. p. 215. ISBN 978-0-520-23081-1. Retrieved 14 April 2007. ^ "Environmental Task Force". National Center for Policy Analysis. Archived from the original on 6 February 2007. Retrieved 14 April 2007. ^ Burnett, H. Sterling (19 September 2005). "Climate Change: Consensus Forming around Adaptation". National Center for Policy Analysis. Archived from the original on 29 September 2007. Retrieved 14 April 2007. ^ Logan, Andrew; Grossman, David (May 2006). "ExxonMobil's Corporate Governance on Climate Change" (PDF). Ceres & Investor Network on Climate Risk. Archived from the original (PDF) on 23 September 2006. Retrieved 14 April 2007. ^ "Letter to Michael J. Boskin, Secretary Exxon Mobil Corporation" (PDF). Investor Network on Climate Risk. 15 May 2006. Archived from the original (PDF) on 23 September 2006. Retrieved 14 April 2007. ^ Easterbrook, Gregg (24 May 2006). "Finally Feeling the Heat". The New York Times. Retrieved 23 November 2009. ^ Revkin, Andrew C. (3 June 2002). "Bush climate plan says adapt to inevitable Cutting gas emissions not recommended". San Francisco Chronicle. Retrieved 14 April 2007. ^ "Climate Compendium: International Negotiations: Vulnerability & Adaptation". Climate Change Knowledge Network & International Institute for Sustainable Development. 2007. Archived from the original on 1 July 2007. Retrieved 14 April 2007. ^ Revkin, Andrew C. (23 October 2002). "US Pullout Forces Kyoto Talks To Focus on Adaptation – Climate Talks Will Shift Focus From Emissions". The New York Times. Retrieved 14 April 2007. ^ Eilperin, Juliet (7 April 2007). 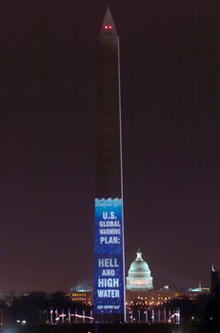 "U.S., China Got Climate Warnings Toned Down". The Washington Post. pp. A05. Retrieved 30 December 2008. ^ "Letter to The Honorable George W. Bush — State Attorneys General – A Communication From the Chief Legal Officers of the Following States: Alaska, California, Connecticut, Maine, Maryland, Massachusetts, New Hampshire, New Jersey, New York, Rhode Island, Vermont". 17 July 2002. Archived from the original on 27 September 2007. Retrieved 14 April 2007. ^ Monbiot, George (December 2006). "Costing Climate Change". New Internationalist. Retrieved 14 April 2007. ^ Schwartz, Peter; Randall, Doug (February 2004). "An Abrupt Climate Change Scenario and Its Implications for United States National Security". Global Business Network for the Department of Defense. Archived from the original on 18 February 2007. Retrieved 14 April 2007. ^ Engineering, and Public Policy (U. S.) Panel on Policy Implications of Greenhouse Warming Committee on Science (1992). Policy Implications of Greenhouse Warming: Mitigation, Adaptation, and the Science Base. National Academies Press. p. 944. ISBN 978-0-309-04386-1. Retrieved 14 April 2007. ^ "Cap and Trade's Economic Impact". Council on Foreign Relations. 2009. Retrieved 9 August 2017. ^ "Paris Agreement". United Nations Treaty Collection. 12 December 2015. ^ Goddard, Jacqui (4 June 2008). "Nasa 'played down' global warming to protect Bush". The Scotsman. Edinburgh. Archived from the original on 24 November 2010. Retrieved 12 February 2010. ^ Rule, E. (2005) "Possible media attention" Email to NOAA staff, 27 July. Obtained via FOIA request on 31 July 2006. and Teet, J. (2005) "DOC Interview Policy" Email to NOAA staff, 29 September. Originally published by Alexandrovna, L. (2005) "Commerce Department tells National Weather Service media contacts must be pre-approved" The Raw Story, 4 October. Retrieved 22 December 2006. ^ Revkin, Andrew C. (29 January 2006). "Climate Expert Says NASA Tried to Silence Him". The New York Times. Retrieved 14 April 2007. ^ "Climate chaos: Bush's climate of fear". BBC Panorama. 1 June 2006. Retrieved 14 April 2007. ^ Hulme, Mike (4 November 2006). "Chaotic world of climate truth". BBC News. Retrieved 14 April 2007. ^ "Groups Say Scientists Pressured On Warming". CBC and Associated Press. 30 January 2007. Retrieved 14 April 2007. ^ Donaghy, Timothy; Freeman, Jennifer; Grifo, Francesca; Kaufman, Karly; Maassarani, Tarek; Shultz, Lexi (February 2007). "Appendix A: UCS Climate Scientist Survey Text and Responses (Federal)" (PDF). Atmosphere of Pressure – Political Interference in Federal Climate Science. Union of Concerned Scientists & Government Accountability Project. Archived from the original (PDF) on 25 March 2013. ^ Taranto, James (1 February 2007). "They Call This Science?". OpinionJournal.com. Retrieved 14 April 2007. ^ "ABC World News Sunday". ABC News. 23 May 2010. ^ "Statement of the AAAS Board Of Directors Concerning the Virginia Attorney General's Investigation of Prof. Michael Mann's Work While on the Faculty of University of Virginia" (PDF). AAAS. 18 May 2010. Retrieved 30 July 2010. ^ Gentile, Sal. "Climate scientist calls Va. attorney general's fraud probe 'harassment'". PBS. Retrieved 7 September 2010. ^ Kumar, Anita (2 March 2012). "Va. Supreme Court tosses Cuccinelli's case against former U-Va. climate change researcher – Virginia Politics". The Washington Post blogs. Retrieved 2 March 2012. ^ Goldenberg, Suzanne (2 March 2012). "Virginia court rejects sceptic's bid for climate science emails : Environment". The Guardian. London. Retrieved 2 March 2012. ^ Reddy, Sudhakara (2009). "The Great Climate Debate". Energy Policy. 37 (8): 2997–3008. doi:10.1016/j.enpol.2009.03.064. ^ de Granados, Oriana Zill (2007-04-24). "The Doubters of Global Warming". PBS. Retrieved 19 February 2014. ^ Lifsher, Marc (18 September 2007). "Global warming lawsuit dismissed". Los Angeles Times. Archived from the original on 4 October 2009. ^ Tanner, Adam (18 September 2007). "Calif. suit on car greenhouse gases dismissed". Reuters. Archived from the original on 15 February 2013. ^ Pidot, Justin R. (2006). "Global Warming in the Courts – An Overview of Current Litigation and Common Legal Issues" (PDF). Georgetown University Law Center. Archived from the original (PDF) on 4 June 2007. Retrieved 13 April 2007. ^ "Proposed Settlement Agreement, Clean Air Act Citizen Suit". United States Environmental Protection Agency. 12 August 2005. Retrieved 13 April 2007. ^ The Sierra Club vs. Stephen L. Johnson (United States Environmental Protection Agency) , 03-10262 (United States Court of Appeals for the Eleventh Circuit 20 January 2006). Ipcc sar wg3 (1996). Bruce, J.P.; Lee, H.; Haites, E.F., eds. Climate Change 1995: Economic and Social Dimensions of Climate Change. Contribution of Working Group III to the Second Assessment Report of the Intergovernmental Panel on Climate Change. Cambridge University Press. ISBN 978-0-521-56051-1 (pb: 0-521-56854-4) pdf. Hulme, Mike (2009). Why we disagree about climate change: understanding controversy, inaction and opportunity. Cambridge, UK: Cambridge University Press. ISBN 978-0-521-72732-7. This page was last edited on 6 April 2019, at 01:52 (UTC).